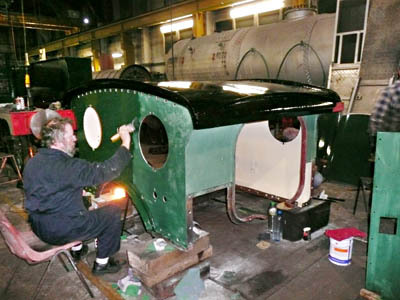 The team, having completed the restoration of 178, moved onto their next project - SECR P-class No.323 "Bluebell", and this project, completed in March 2011 has its own page. 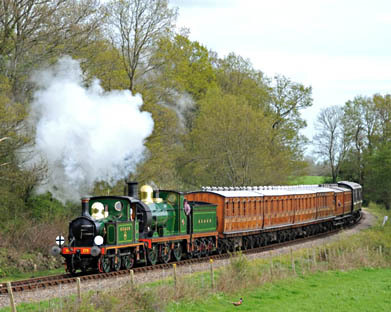 Any Bluebell Railway members interested in lending a hand can e-mail for more information or to let us know that you will be coming along. 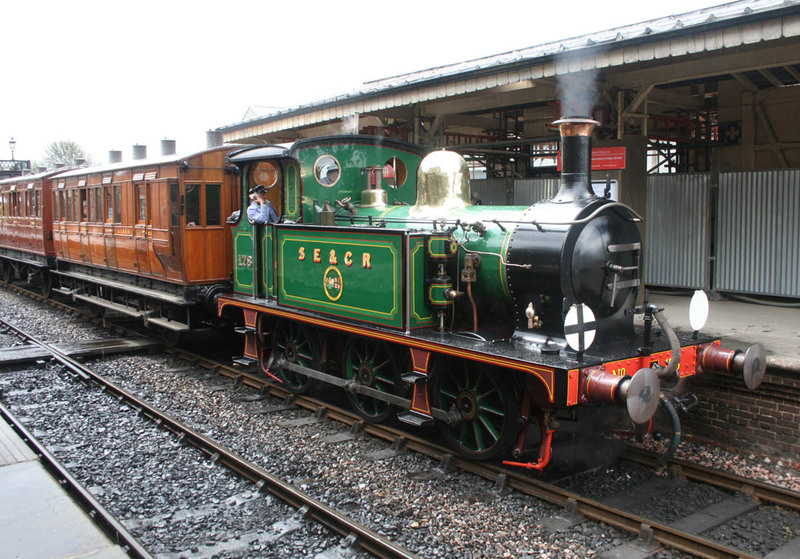 In July 2011 the team moved on to the overhaul of the SR Maunsell Q-class. 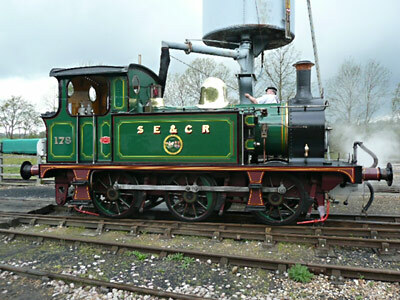 On Saturday 1st May 2010, No.178 was offically launched into traffic, signalling the end of its overhaul. 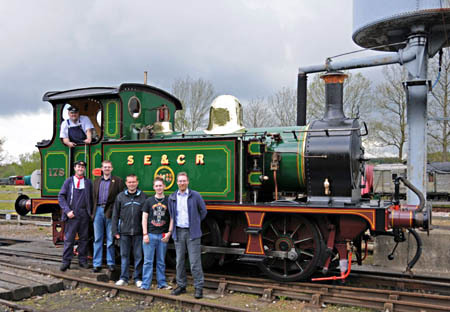 The loco is now in full SECR livery, as seen in photos here, from Rob Faulkner, Derek Hayward, Tony Sullivan and Andrew Strongitharm. This followed its brief appearance in Bowaters' livery. The C-class, with which it is seen in two of the photos below, was the group's previous project. 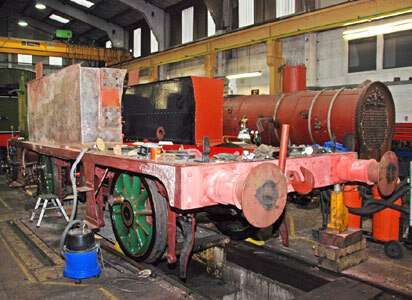 There are more photos from 1st May on Rob Faulkner's web page for the loco's restoration. Even though the loco was in steam this weekend as shown in the photos above from Derek (above left) and Rob (above right), 178's overhaul continues. There are plenty of little jobs that need completing, such as fitting the windows and the cab doors. The windows were being cleaned up, ready for fitting shortly. Shaun was tasked with cleaning up the cab doors for 178 'Nettle'. 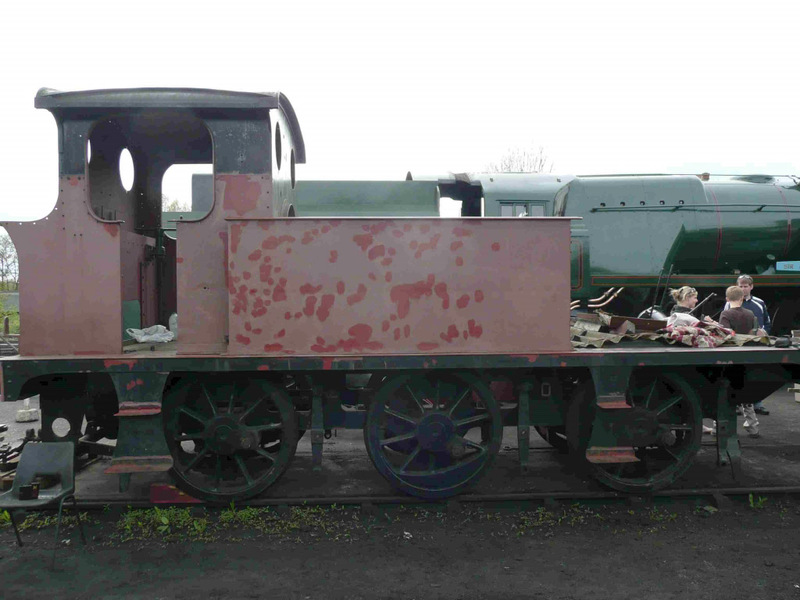 These had been painted black, after its arrival on the railway. 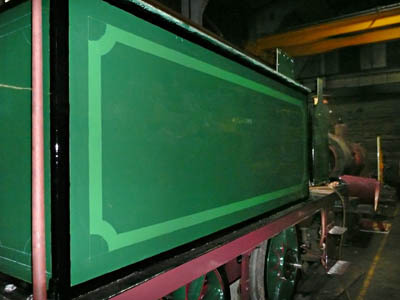 Sanding down the layers of the paint, revealed the Bowaters lining from the 1960s as shown in the photo below. 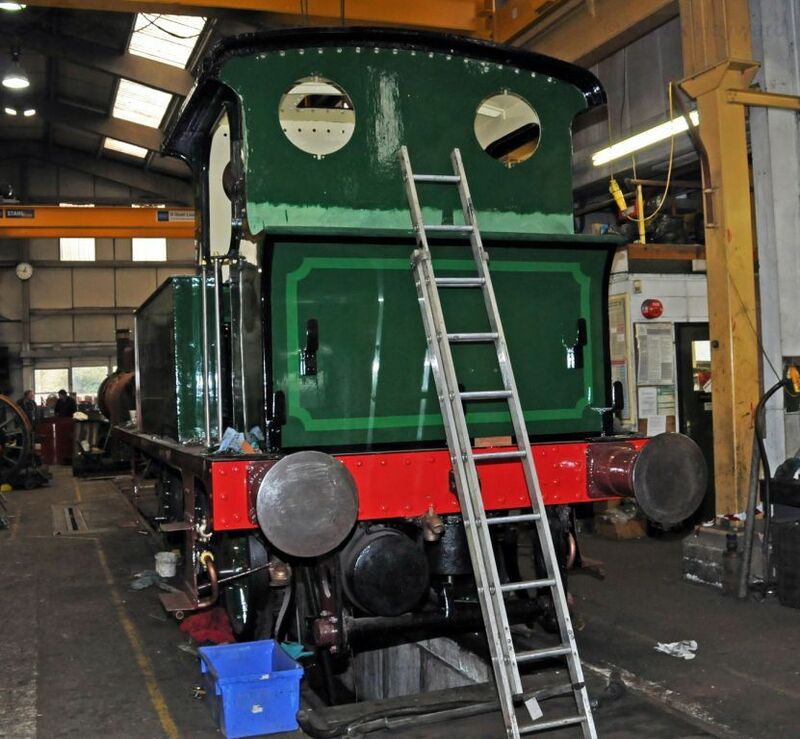 With only a few small jobs remaining on the overhaul of 178, the rest of the group have moved onto their next project - 323 "Bluebell". You can follow the progress of 323's overhaul here. Photos from Rob Faulkner and Derek Hayward. At the 11th hour on the Friday before Branch Line Weekend was due to start, it was announced that 178 'Nettle' would not be steaming on the Saturday as its overhaul hadn't been completed in time. 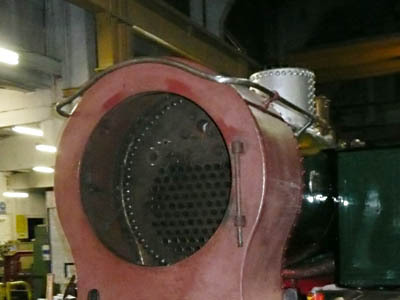 However Chris Shepherd and his team, assisted by the Loco Working Group, managed to resolve the issues with the steam reverser at around 7pm on the Saturday evening. 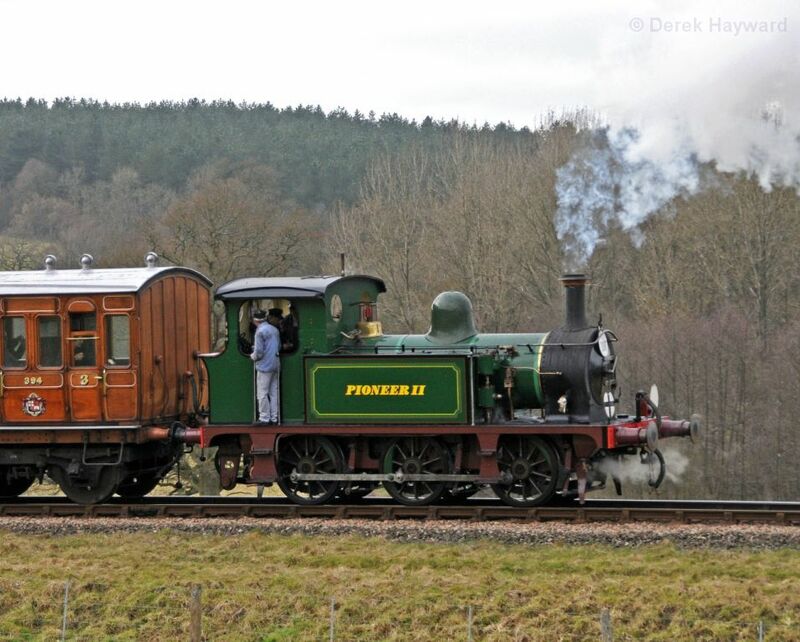 This meant that 178 could steam at Branch Line Weekend after all, and made its first moves around Sheffield Park on the Sunday as shown in the two photos below taken by Derek Hayward. 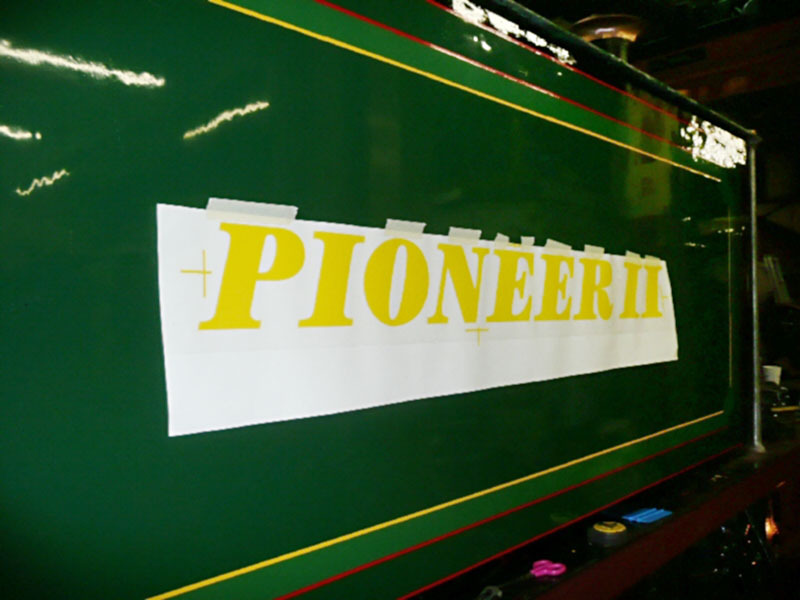 With this news Mike Carroll, aided by Rob Faulkner, decided to add the finishing touches to the loco's preservation debut, by putting on the Pioneer II transfers that it will wear until its lining can be completed (hopefully after next month's special timetable workings). This wasn't completed until 9pm showing the determination to have to loco steaming that weekend. Rob's two photos below show the transfers being added and the final result. 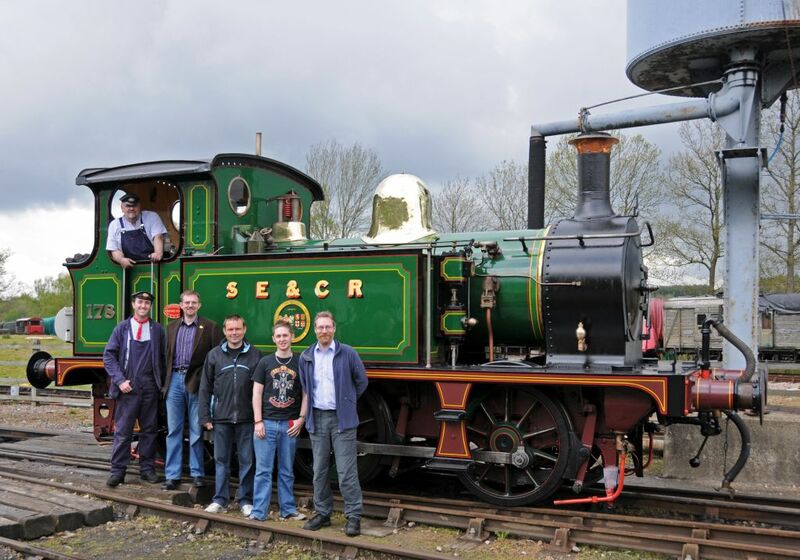 The group are obviously all proud of their acheivements over the past 2 years, but also thanks all those from around the Railway, who helped get the loco ready in time. 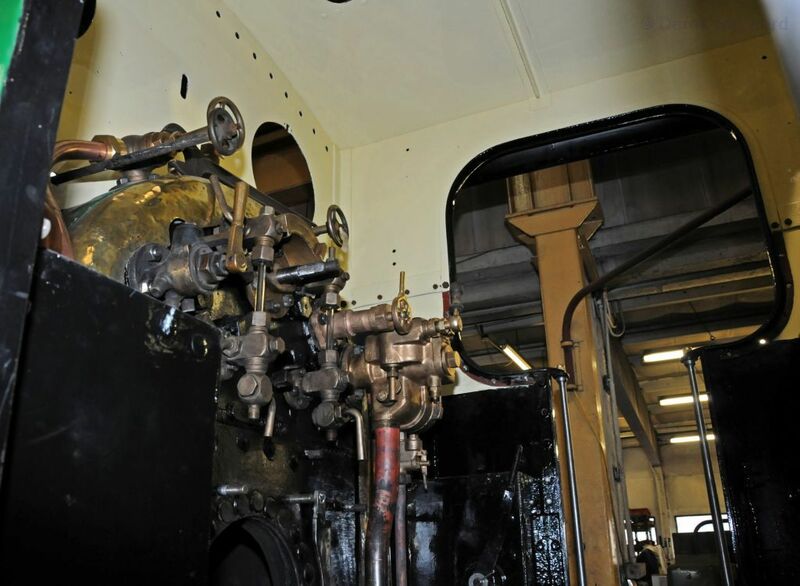 Finally the group would like to say a big thank you to Chris Shepherd and his team for all the assistance and advice during the overhaul and for the effort that they have put in as well, to have the loco ready for this weekend. I know they are all in need of a huge rest! P-Class 178 passed its full steam test yesterday. Subject to its overhaul being completed in time and no issues found, the loco should be in steam this coming weekend for the first time since it entered preservation. Derek Hayward's four photos taken on Saturday 13th show progress accelerating, with the aim of steaming the loco in time to take part in the Branch Line event next weekend. You can see from the pictures just how much has gone back on the loco in the last week, from the blast-pipe and chimney, reverser and water-feed, to the cab roof and boiler backhead fittings. See more of Derek Hayward's photos of 178. 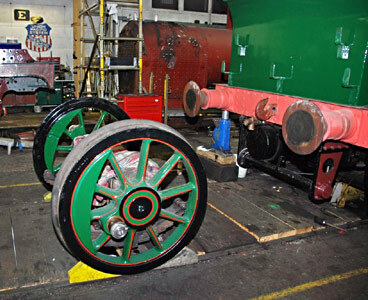 Rob Faulkner's photo above shows the centre wheelset being lifted into place on the wheel-drop on Sunday 31st January. The motion has since been connected up between the frames. Progress since then has continued at a very fast pace. 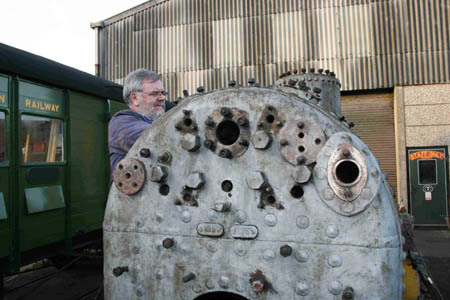 In the following week, Chris Shepherd and his merry men have put the the boiler back in the frames, the smoke box has been attached to the boiler, boiler cladding has been fitted, the tanks have been fitted to the chassis for the final time (this couldn't be done before as they briefly had to come off for the boiler to be fitted) and are now having the various fittings and pipework connected. 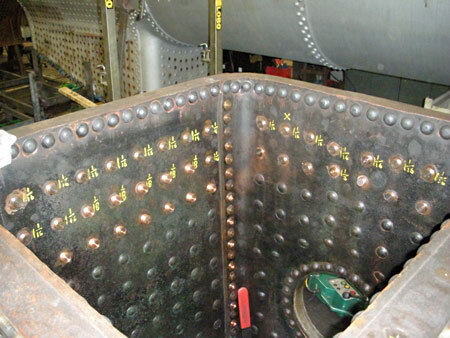 Derek Hayward's photo above shows Lewis Nodes marking out the side-tanks for lining on Saturday 6th February. 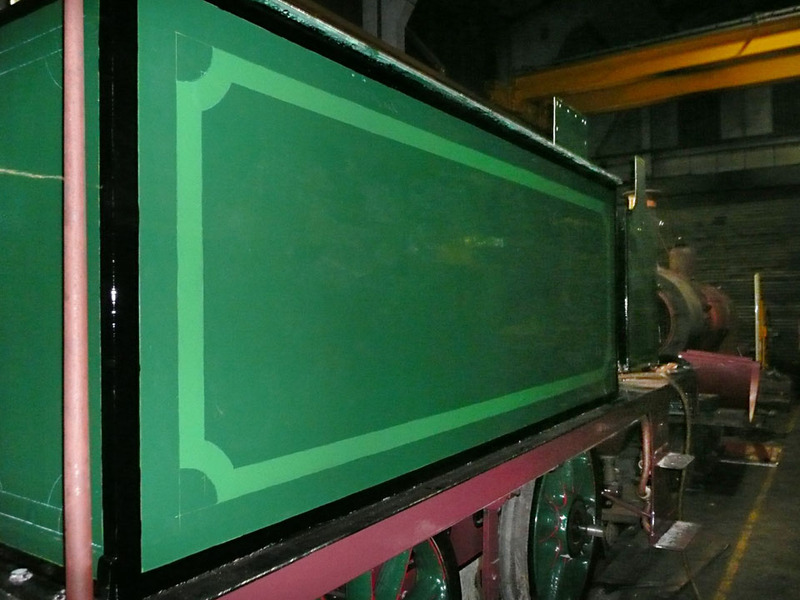 By 7pm on the Sunday evening the photos below show the completed first stage of the lining on the side tanks, and the hand rail that had just been fitted to the smokebox. 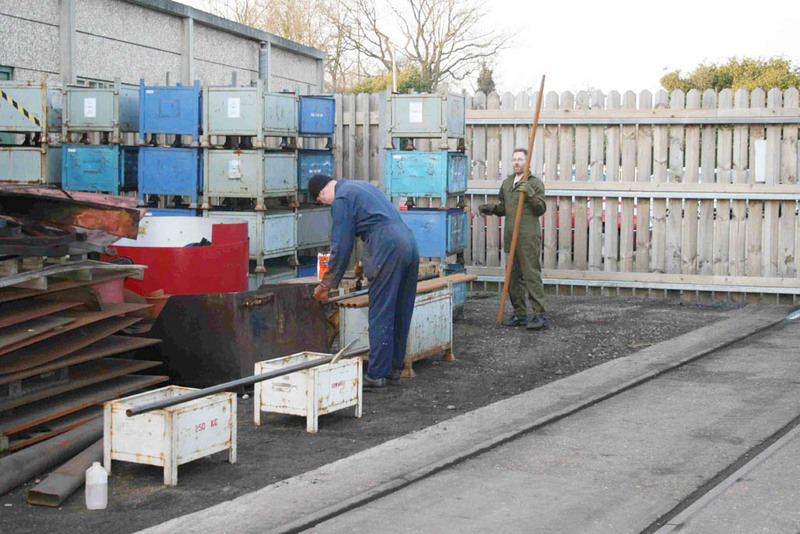 Work is continuing at a fast pace to try and have 178 'Nettle' ready for Branch Line weekend on 20th & 21st February. With this deadline fast approaching the team have started weekly visits to try and assist where needed. We have also been joined by various faces from around the Railway including Roy Watts and Chris Knibbs, their help being very much appreciated. Tasks have included rubbing down the various coats of paint on the cab (inside and out) ready for the next coats to be applied. By the end of Sunday, the first top coats were being applied to the outside of the cab (above) and it's roof. Inside the cab received another cream undercoat. Lewis has continued with the task of painting the loco and the tanks are now receiving their top coats of paint. The bunker has been completed and has started to be lined out (below). 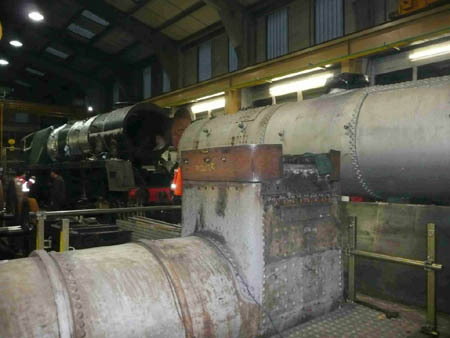 As reported below, the boiler has had a steam test (which it passed) and will soon be reunited with the frames. 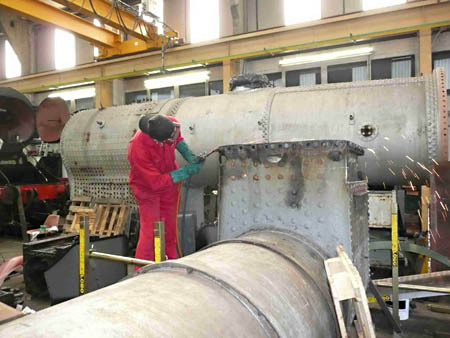 With this in mind, some of the team, including new volunteer Nick, have been assisting once again, rubbing down and then adding another coat of paint to the boiler cladding, as this will be needed as soon as the boiler goes back in the frames. 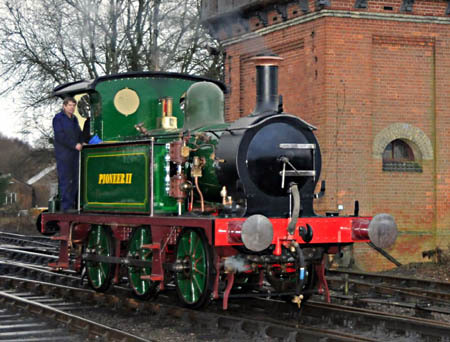 The boiler is that which arrived with 323 'Bluebell' back in 1960, means that part of 178 is connected with the 50th Celebrations. 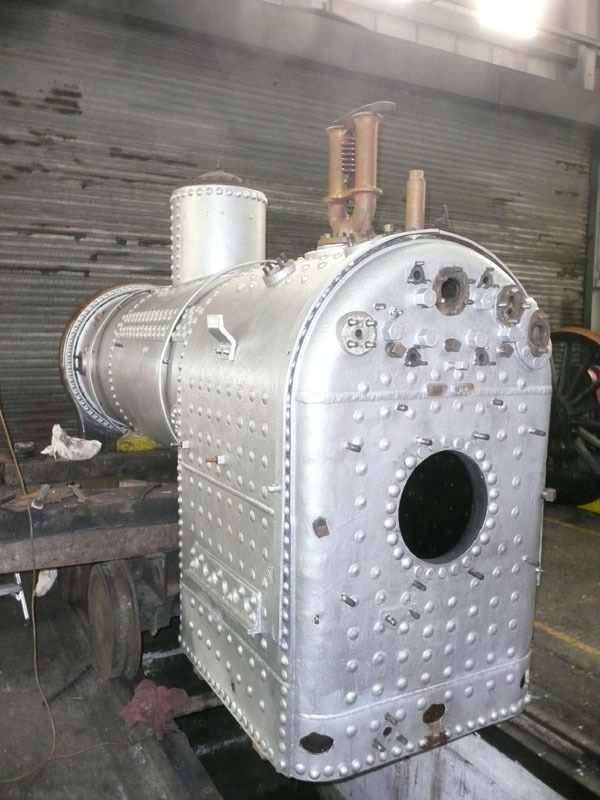 Whilst it is waiting to go back in the frames, the boiler has received a coat of paint itself making it look a lot smarter. 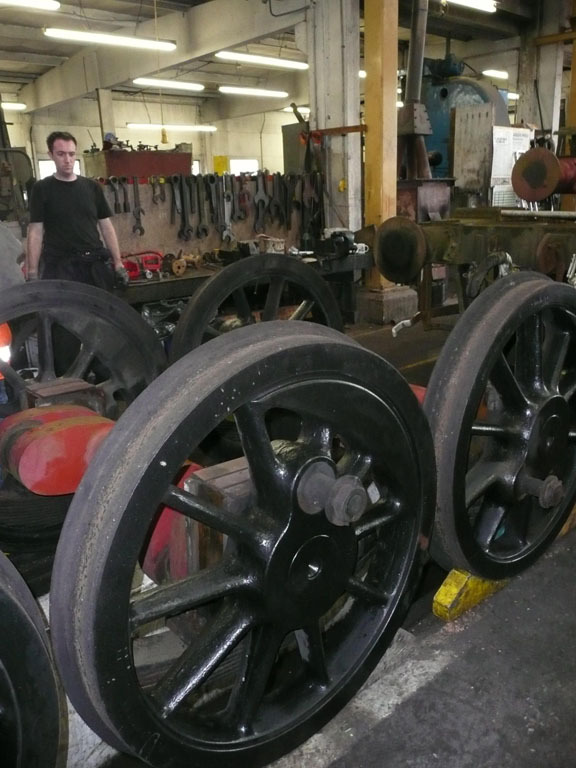 The workshop staff continue to work on the loco during the week and it will not be long before the driving wheels are placed back into the frames, making the loco a 0-6-0 again. 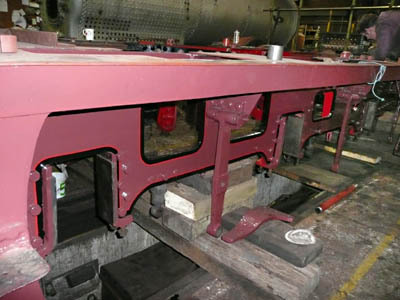 This will enable the final pieces of motion to be connected up and the boiler will be placed into the frames, helping the loco get closer to that finishing line! 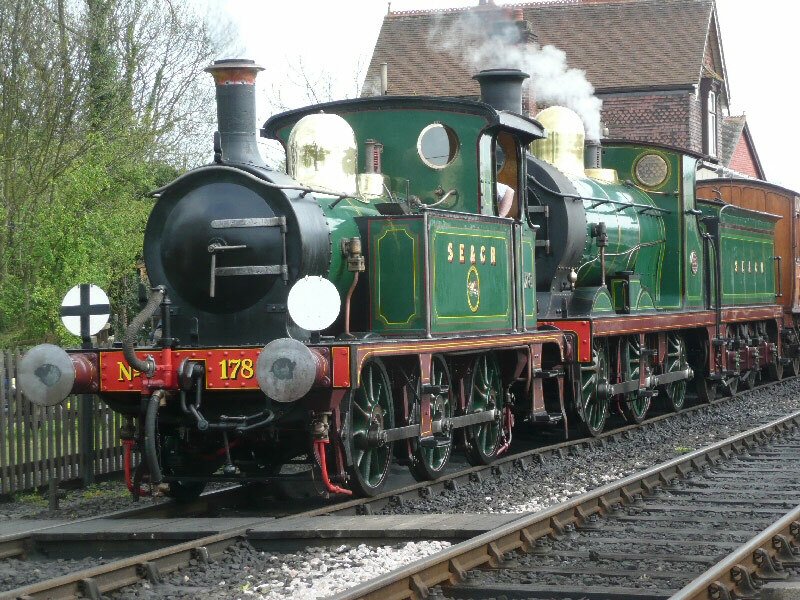 Now is a perfect time to come and help out, and ensure that 178 is available to join in the Bluebell Railway's 50th Celebrations in 2010! Photos and report from Rob Faulkner. Rob has more photos available, and Derek Hayward's gallery has also been updated. 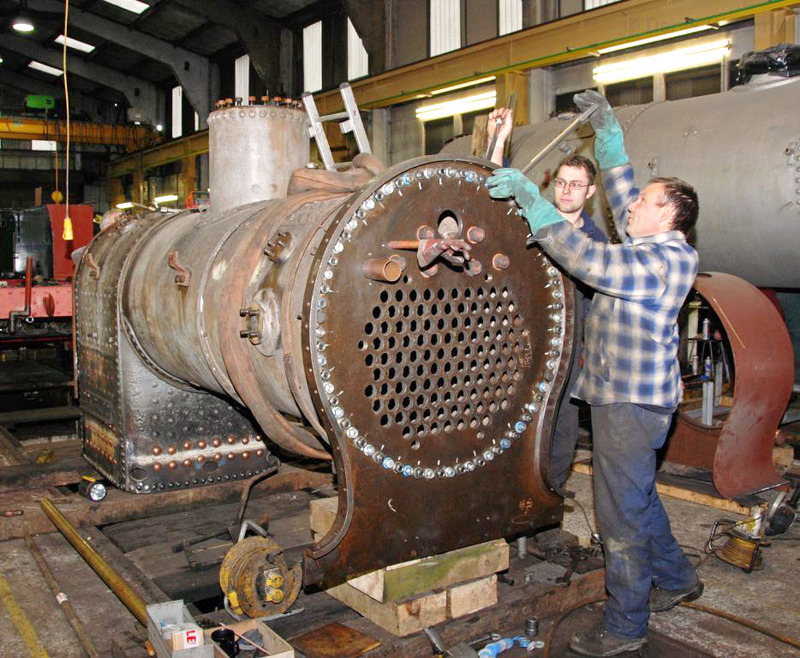 Duncan Bourne's photo shows the boiler for SECR P-class No.178 undergoing its (successful) out-of-frames steam test on 15th January. 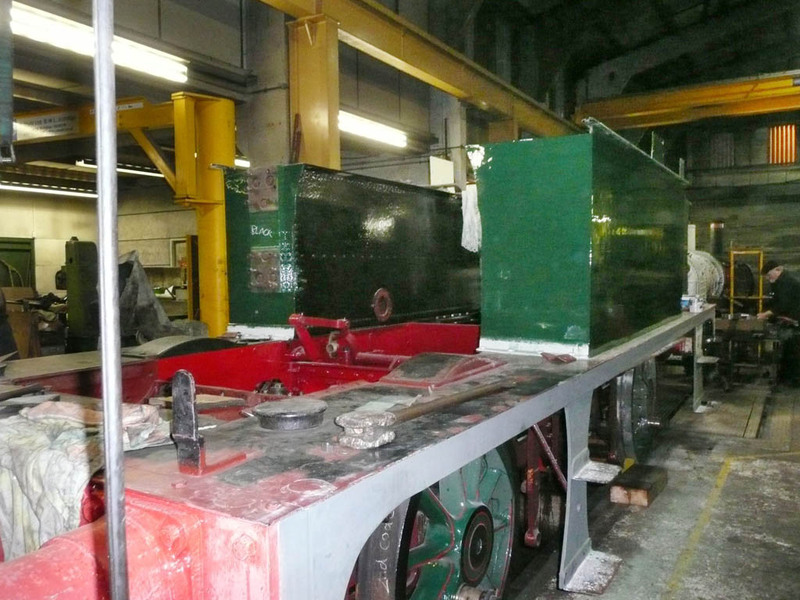 Now the push is on to get the loco back together and ready to run at the Branch Line weekend next month. 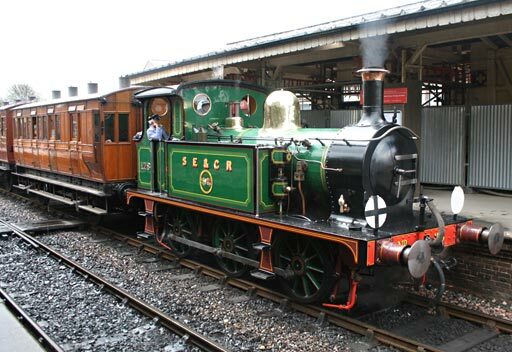 This should be the second of six locos to return to service this year! Over the Christmas break, a huge amount of work has been done on 178. 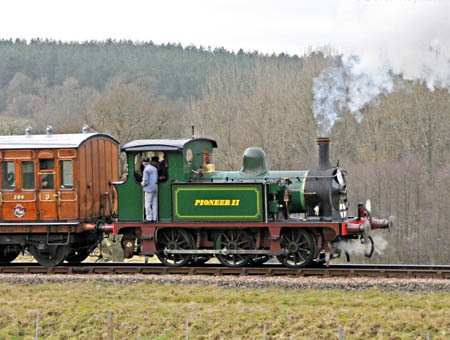 It is a big challenge to get 'Nettle' in service for the Branch Line Weekend in February, but everyone is working hard to make it happen. 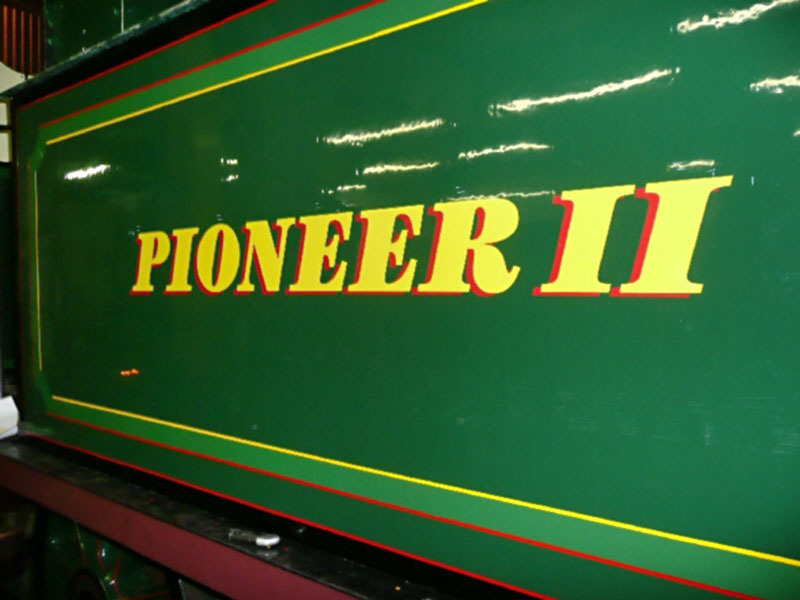 To achieve this, we need to get the boiler finished, tested and certified early in January, in order to stand any chance of assembling, painting and testing the whole locomotive during February. 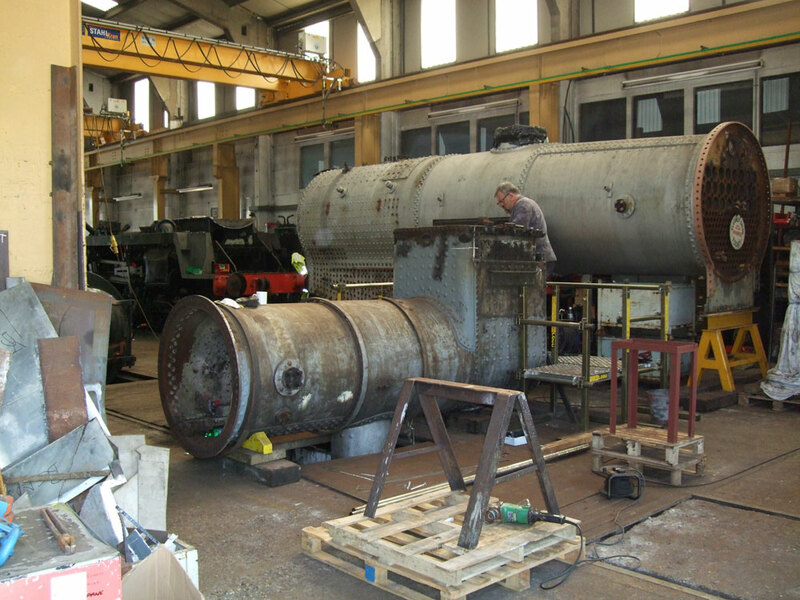 David Pratt's photo (right) shows the final tube being loaded into the boiler. These still require expanding to fit tightly. All of the patch screws are now finished, and the gland faces have been ground flat and new studs fitted. Work is continuing on the regulator components, and we are aiming to have everything together for a hydraulic test on the 11th of January. On the right can be seen the cab, which has been brought into the works to dry out and be prepared for painting. There is lots of complicated paintwork to do on the cab, including lining and scumbling, so it is very close to being on the critical path. 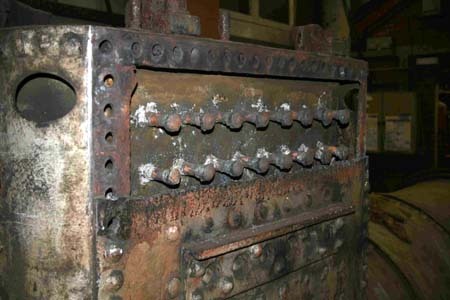 David's other photo (below) shows the state of the rest of the engine. Many hours have been spent in filling and rubbing down the side tanks, but this is now complete and layers of paint are being added. The cab is now in final topcoat. 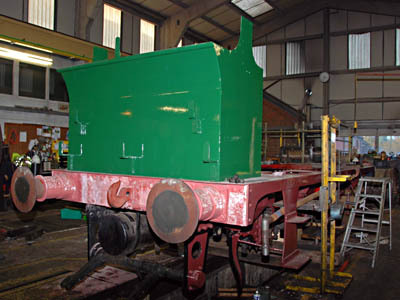 Chris Knibbs (Bluebell Operations Manager) is painting the bufferbeams in topcoat. There's plenty more simple painting to do, so why not come and help us finish Nettle for Branch Line? Since the last update, progress on 178 has been rapid. 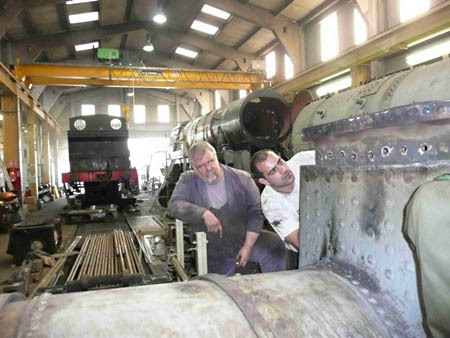 The team has been making additional visits to help progress the project along, in order to achieve our proposed target date for the loco to be running by. Lewis Nodes has finished lining out the frames and wheels (seen in Derek Hayward's photos above), which has meant that the loco has now been rewheeled, except for the driving axle which will be added at a later date. 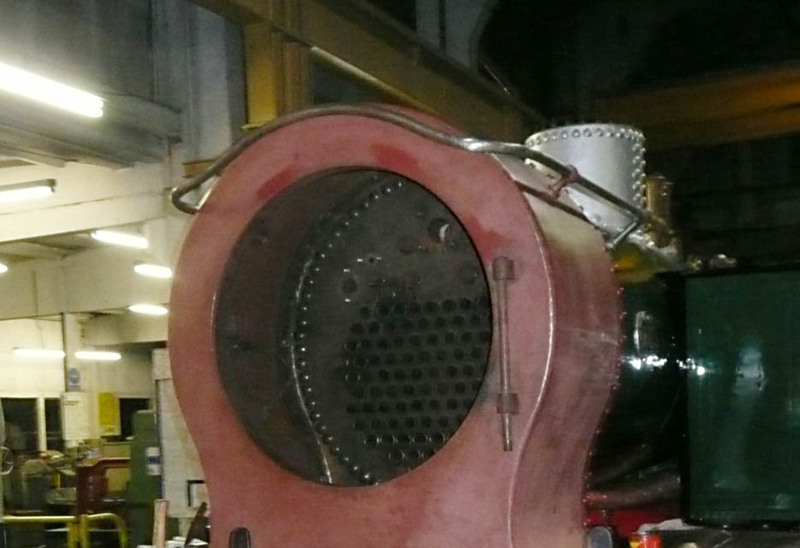 The boiler has been in and out of the frames in order for the tubeplate to be aligned and last Sunday (photo right) it was bolted to the boiler barrel so it could be riveted. 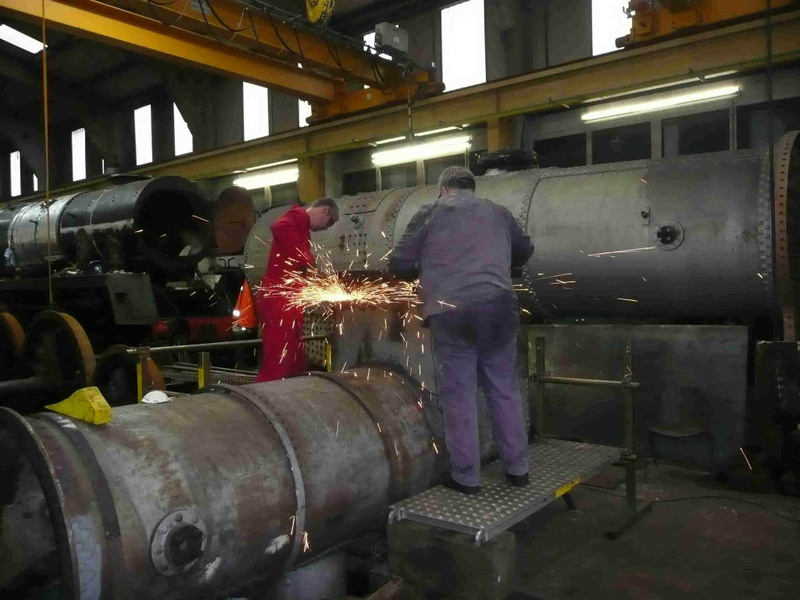 The tanks of the loco are temporarily back on the loco to allow for various jobs to be completed including the creation of various sections of pipework. 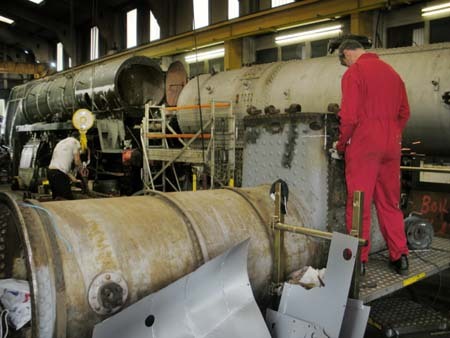 The tanks themselves are now being rubbed down in preparation of painting in the very near future. This task has reveal a layer of filler added during BR days to achieve a smooth finish, which has proven to be difficult to remove. Mike Caroll has been working on fitting various parts of the motion and it won't be long before the pistons and associated parts are fitted. 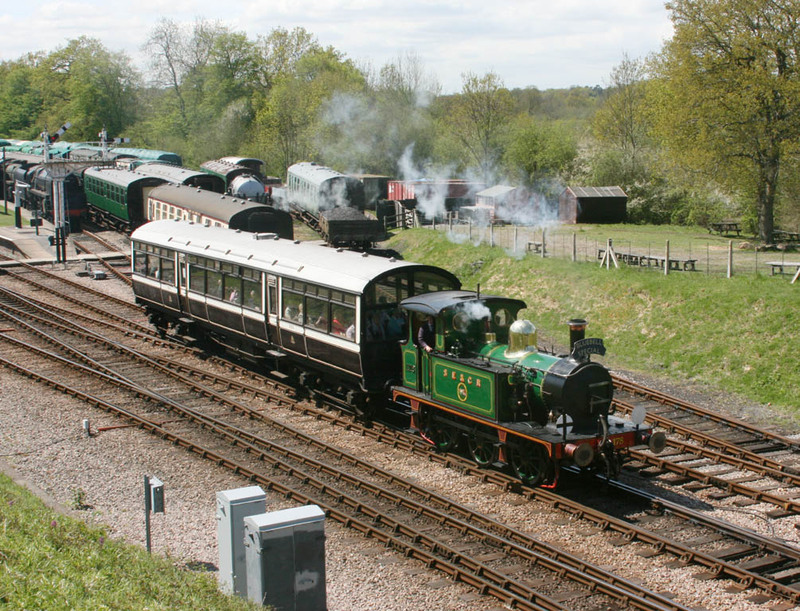 Now is a perfect time to come and help out, and ensure that 178 is available to join in the Bulebell Railway's 50th Celebrations in 2010! Photos © Copyright Derek Hayward, and report from Rob Faulkner, 13 December. Rob also has photos from that day, which additionally shows the newly made ashpan. 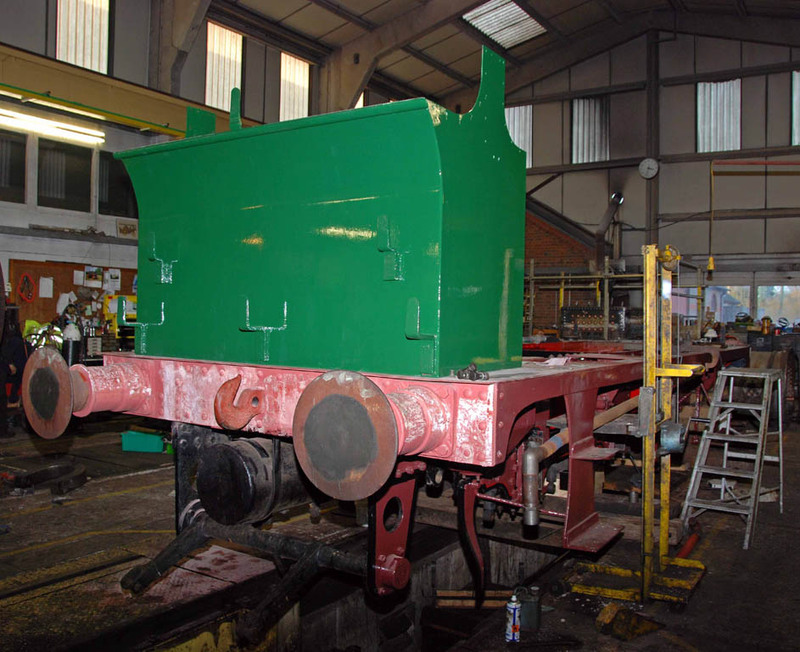 With the push to have 178 ('Nettle') ready for early next year all going well, each week sees major progress with the loco's restoration. 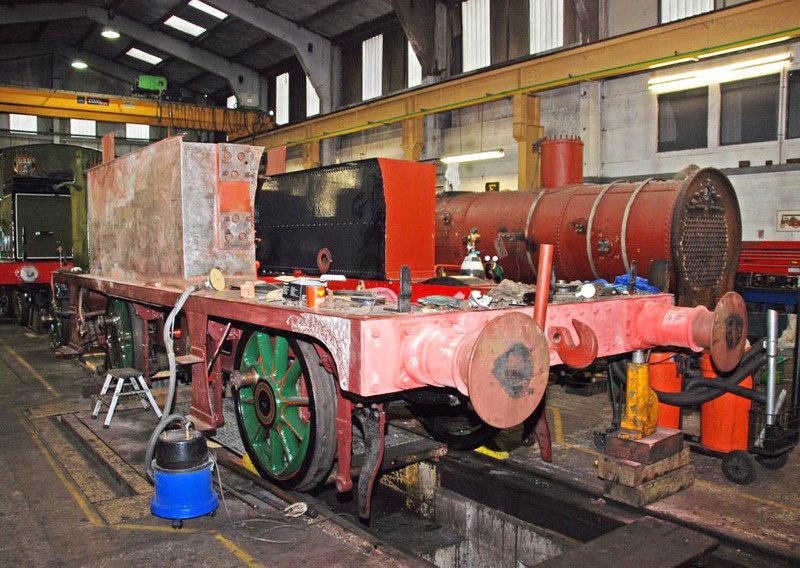 Since the last update, the loco has had the outside of its frames painted and they are now being lined out by Lewis Nodes. 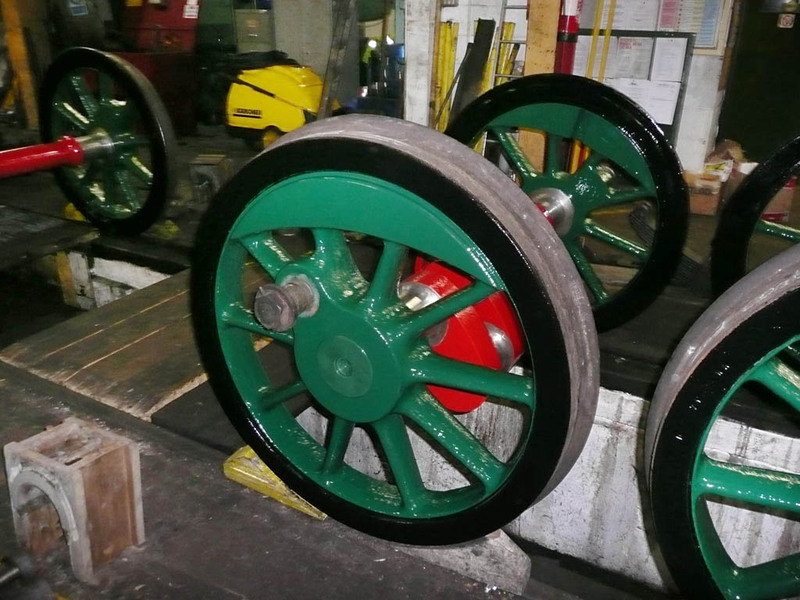 The wheels are now in top coat of SECR green and it's planned that they will be reunited with the frames within the next couple of weeks. 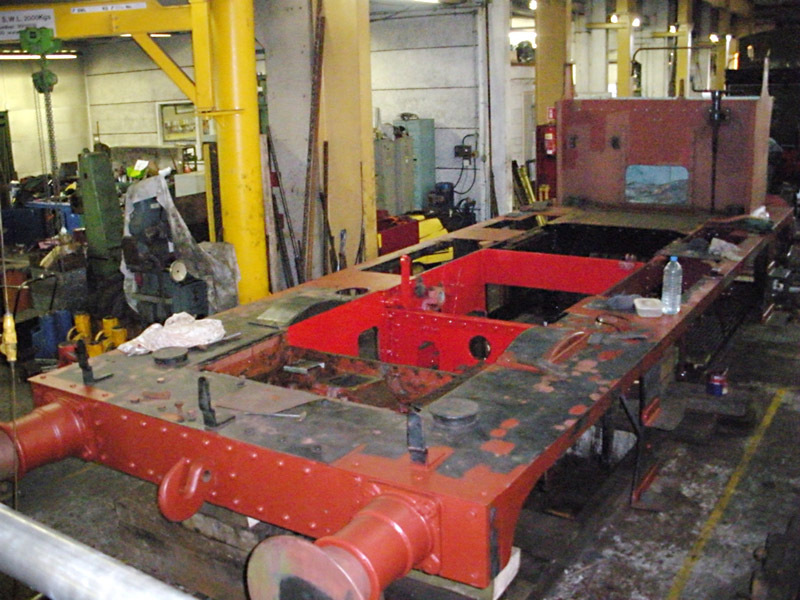 Once rewheeled, the loco's boiler can be trial fitted to the frames so that the tubeplate (seen on the right, already attached to the smokebox wrapper) can be lined up to be fitted. 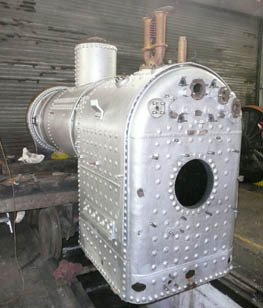 The firebox of the boiler is now in the final stages of completion. All the stays have been fitted and the majority of the patch screws are now in. 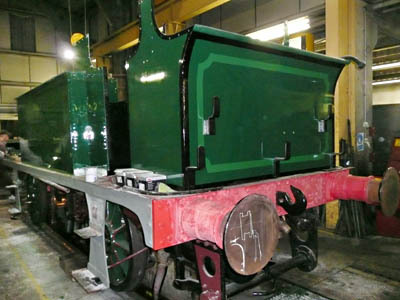 The only ones left to be fitted are those along the top seam of the inner firebox, but these will wait until the boiler is turned on its side following its test fitting. 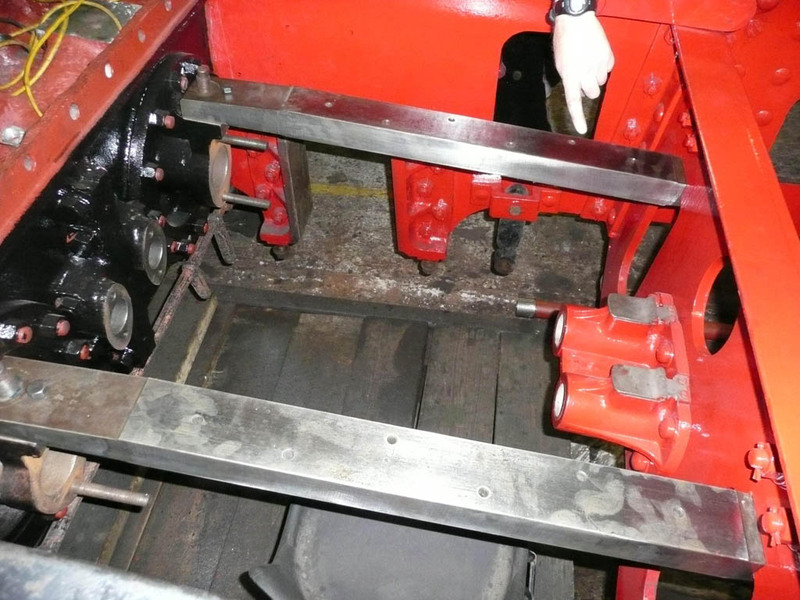 Finally we are also starting to see components being fitted back on the loco. Sunday saw the slide bars re-attached to the loco (see below) and various pieces of pipework being made and cleaned up for the vacuum brake on 178. Photos and report from Rob Faulkner, 8 November, plus the photo below of the bunker coming into top-coat from Derek Hayward, 15 November. More of Rob's photos are available here. 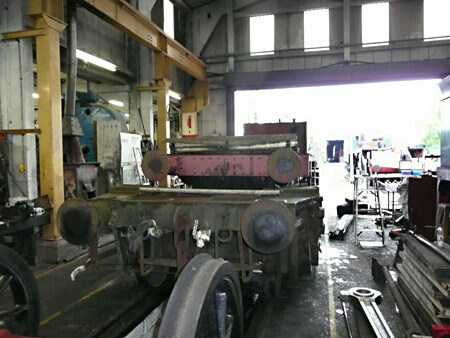 An enormous amount has been achieved in the two weeks since the frames were lifted and brought into the workshop. The 25th of October saw only one of the regular team, but with other volunteers arriving, there was a total of 14 people working on 'Nettle' during the day! 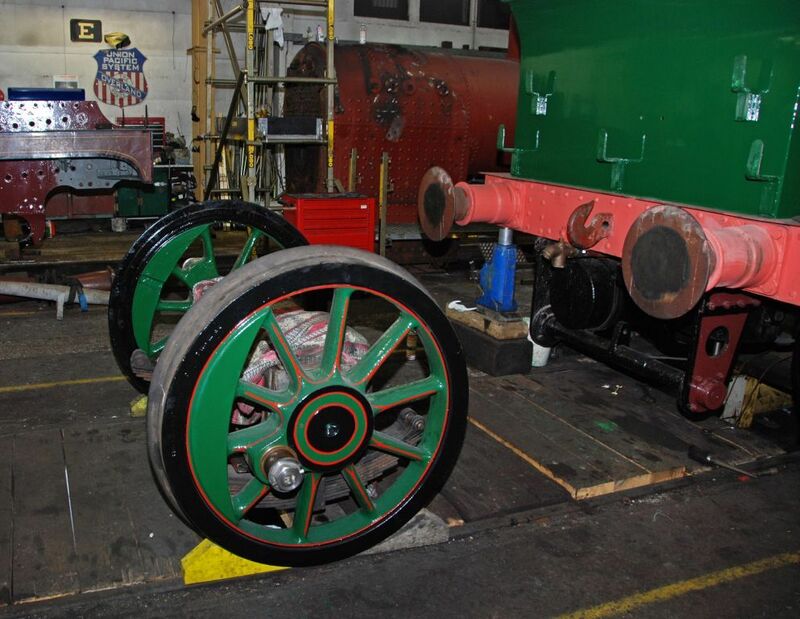 The wheels have all been cleaned and rubbed down ready for priming. The axleboxes and springs have been cleaned, degreased and inspected. The frames have been cleaned inside and out, and all rust spots treated and primed. 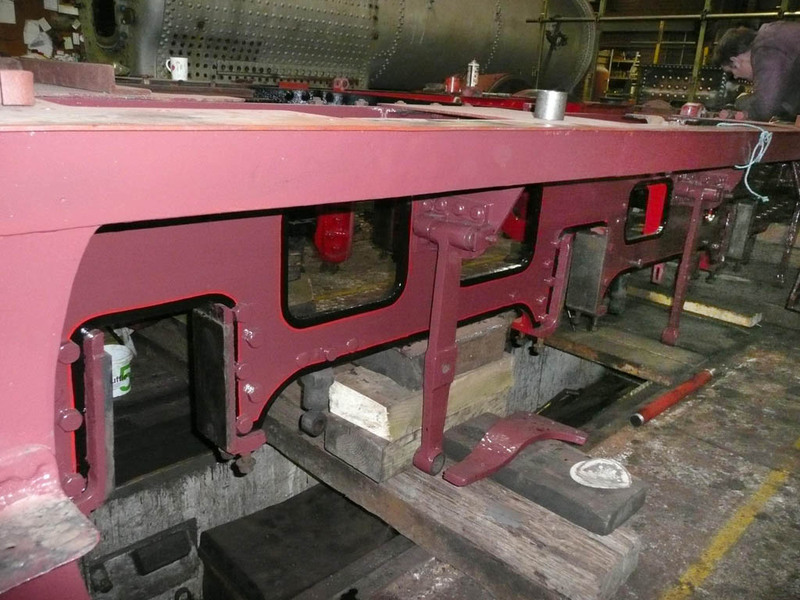 The inside of the frames have been primed and topcoated in red and black, while each side has received the first coat of SECR maroon. 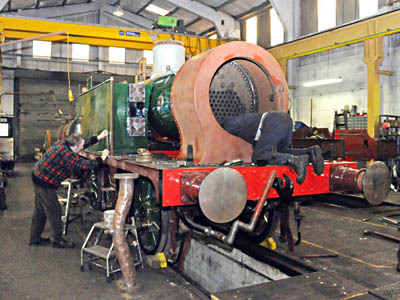 The firebox is progressing well, with attention from the permanent staff during the week. All the stays have been fitted, and are now ready for hammering over. Nearly all the external steel patch screws are in, and only a few of the inside copper screws remain to be fitted. 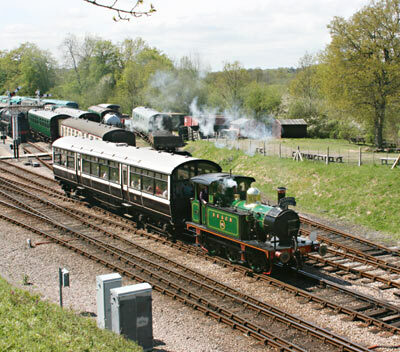 Now is a perfect time to come and help out, and ensure that 178 is available for the Branch Line Weekend in February! 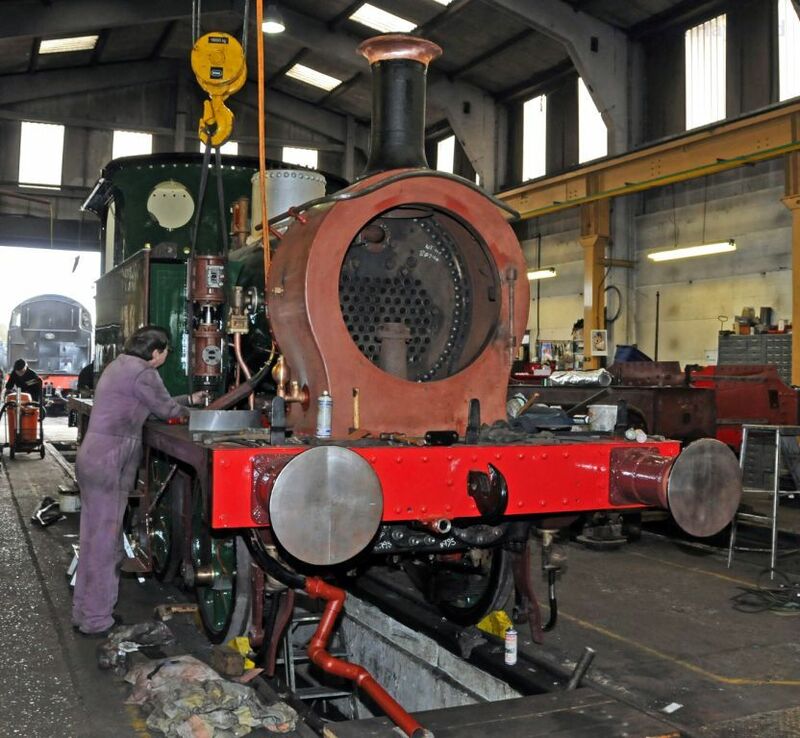 Since the last update, the team have still been working with the workshop staff in completing the firebox. 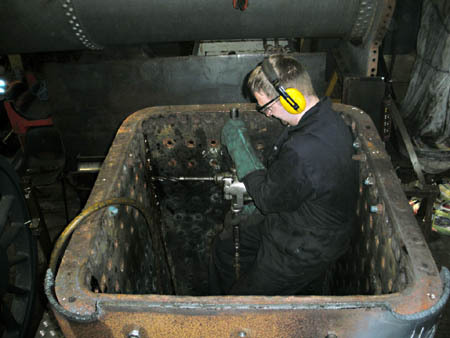 Phil has been doing a sterling job inside the firebox, working on patch screws as usual, whilst the rest of the team have helped out where required on the outside of the boiler. 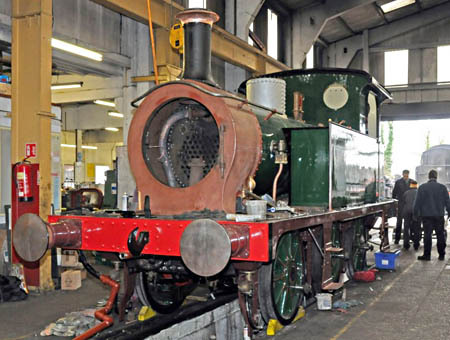 It's slow work and there is still plenty to do on the boiler, but we are getting there. 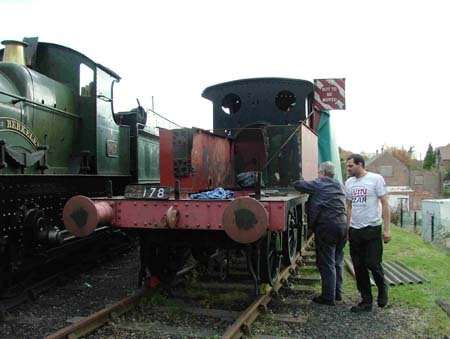 Sunday 11th October however saw a major leap in the restoration on 178, with the loco being shunted into the works for the day. With a loan of a wagon from the P-Way department, 178 frames were lifted off its wheels and onto the wagon to enable its frames and wheels to be cleaned and painted in its proposed livery, before it's reassembled. The reason for placing it on the wagon: it's due to proposed space in the works for 178's frames, being taken up by U-Class 1638. We have roughly 6 weeks to complete cleaning and painting the frames and wheels before the wagon has to be returned to the P-Way department, so it will be all hands to the deck. At the same time, the cab and tanks were also removed, so they can be cleaned up, repaired and painted prior to reassembly at a later date. Plenty of work therefore for any new volunteers interested in helping out! Thanks to Rob Faulkner for this report and photos. More of Rob's photos are here. 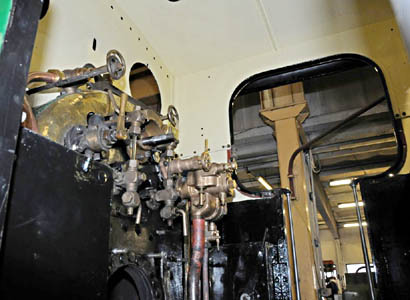 Work had slowed substantially on 178 over the summer, with most of our team being unable to make meetings at one time or another, and the workshop staff being busy with work on the E4. Work has restarted however, and the photo on the right shows that the Foundation Ring is now fully rivetted in place! The white paint along the welds is used to check for cracks, and they have also been inspected ultrasonically. All the welds are up to standard, and the boiler inspector has taken a look while he was here for the E4 steam test. In the photo, the wires hanging out of the mudhole doors are welded to the heads of the bolts holding the vertical seams together. Rob has now tapped out the intermediate holes, meaning that steel patch screws can now be fitted there. Once these are fitted, the bolts can be undone and removed by pulling on the wires, then those holes tapped and patch screwed in the same way. Also on the 9th, some more work was done to the copper patch screws inside the firebox, and the new stay holes were opened out, ready for reaming and then tapping to size to take new stays. 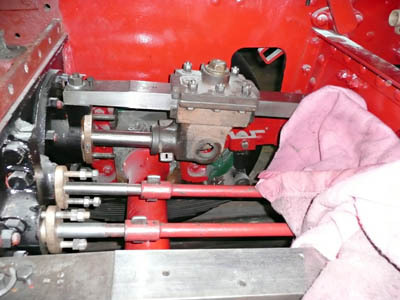 Once the patch screws are finished, and all the stays fitted, then the boiler can be trial fitted to the frames in order to fit the front tubeplate and start tubing. 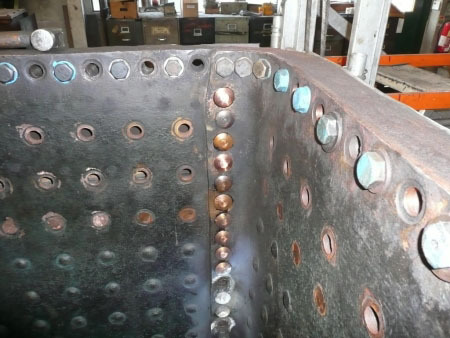 The new firebox plate has been welded into position, and the foundation ring rivet holes drilled, reamed and countersunk. As can be seen in the picture on the right, riveting has now started, and pretty much the whole back face has been finished. The mudhole doors have also been formed, and the two smaller holes on the corner of the plate (either side of the bolt) will be enlarged and fitted with steel patch screws, as these holes don't go right through the ring. At the bottom of the picture can be seen a pile of rivets cut to length, waiting to be fitted. Work has been continuing inside the firebox too, with more copper patch screws being fitted to the seams. The picture below shows the newly fitted screws, and evidence of the removal of the remaining ones. 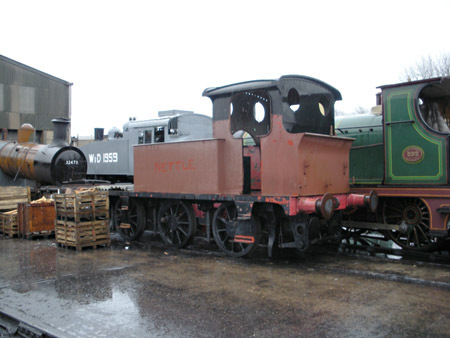 Finally, 'Nettle' has been moved into the safety of the storage shed, near to Bluebell. This will help her to dry out, and stop any more rust forming before we can start serious work on the frames in coming months. More Photos from the 31st of May are in Rob Faulkner's photo album. Due to people being busy on the Southern at War weekend, we decided to hold a meeting on the 3rd of May instead of the 10th. 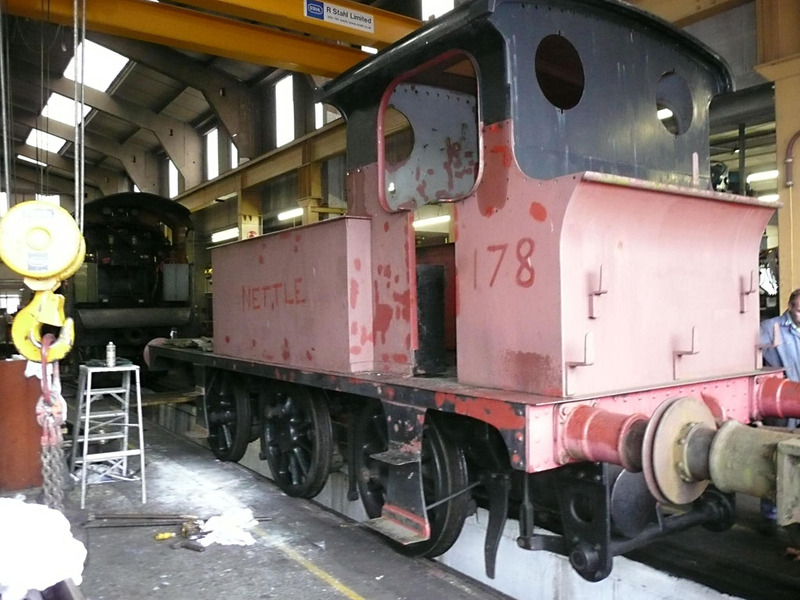 Ben was working on the boiler in the shed, so Rob and Duncan spent the day out in the sunshine, scraping the rust and flaking paint off 'Nettle' and giving Her a touch-up with red oxide. I'm sure She's better protected because of it, but She does now look like She has some horrible skin disease, as you can see in Rob's photo on the right. 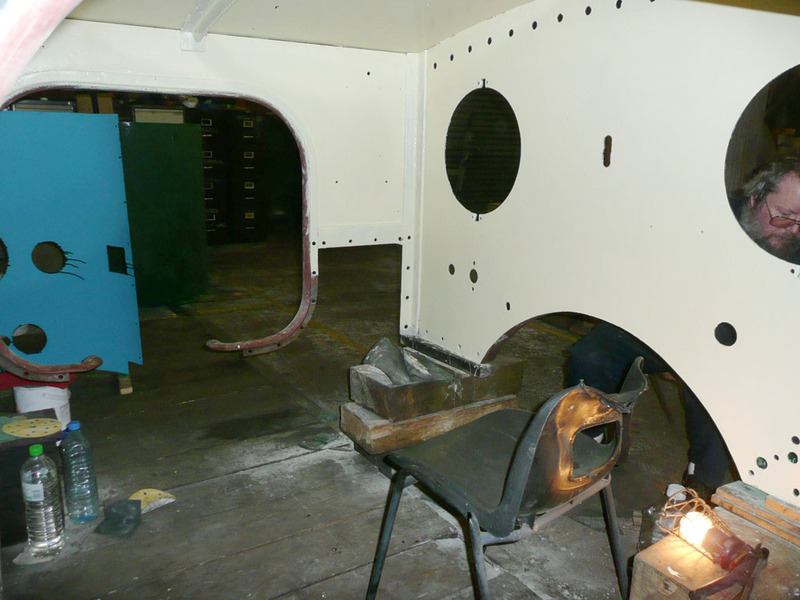 Since the last meeting, Ben has fitted the side plates to the firebox, and drilled and countersunk the rivet holes. The Coded Welder should have visited by now, and joined everything together properly, then we need to fit the rivets around the foundation ring. After that, we need to finish the patch screwing inside the firebox, fit new stays, then the tubeplate and tubes. 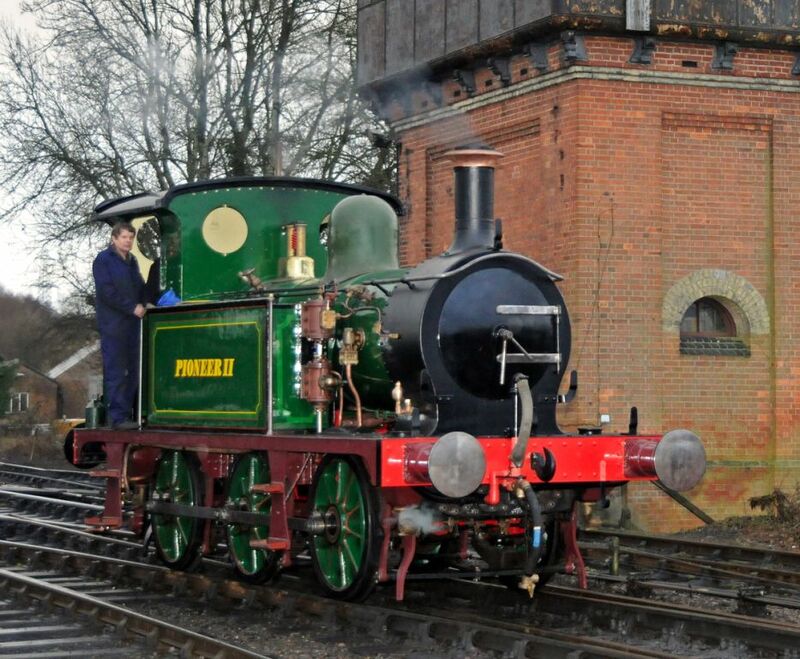 The picture below shows the firebox on the 3rd of May. More Photos from the 3rd of May are in Rob Faulkner's photo album. Since our last meeting, Ben has been working hard through the week and the whole project has made a great leap forward. 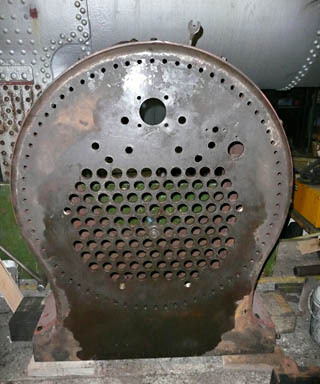 The front and back plates have been finish formed, pilot holes drilled, and tacked in place on the firebox. Attention is now turning to the side plates, and finishing the patch screwing before the visit by the coded welder, and then the boiler inspector. 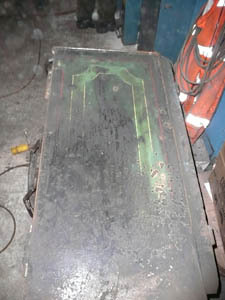 The first photo shows the fitted front plate, with the first mudhole door flame-cut. 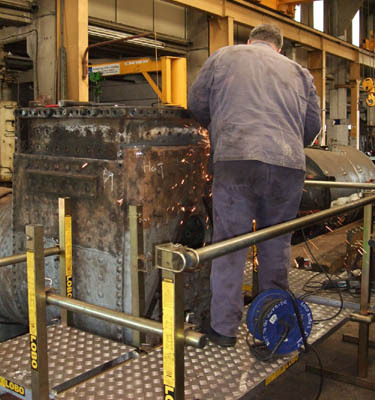 The second picture shows the rear plate, with Phil working hard inside tapping and countersinking the copper inner firebox for the replacement patch screws. Rob spent the day grinding down one of the side plates to follow the edge of the foundation ring. This needs to be a good fit to allow the edge to be caulked, providing a good seal. Duncan was working on the other side plate with Ben, which was cut and pilot drilled by the end of the day. 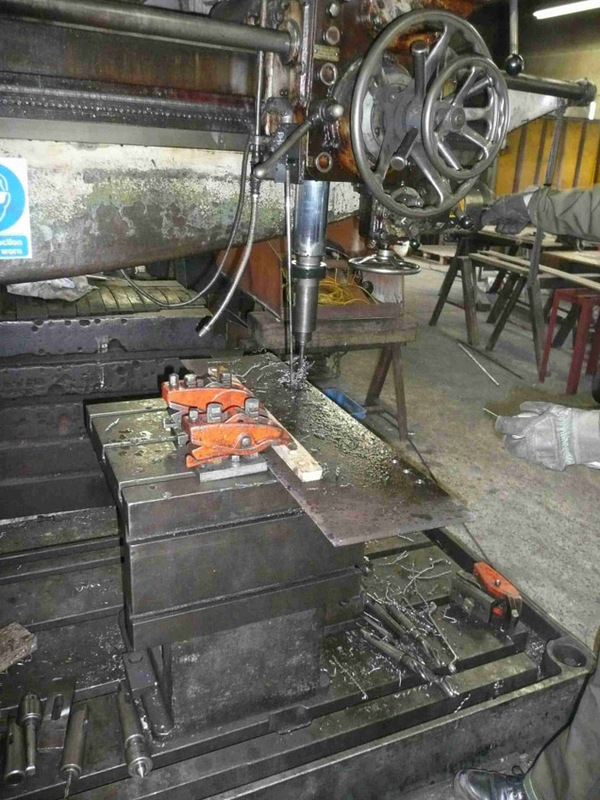 The third picture shows the plate on the radial drill. 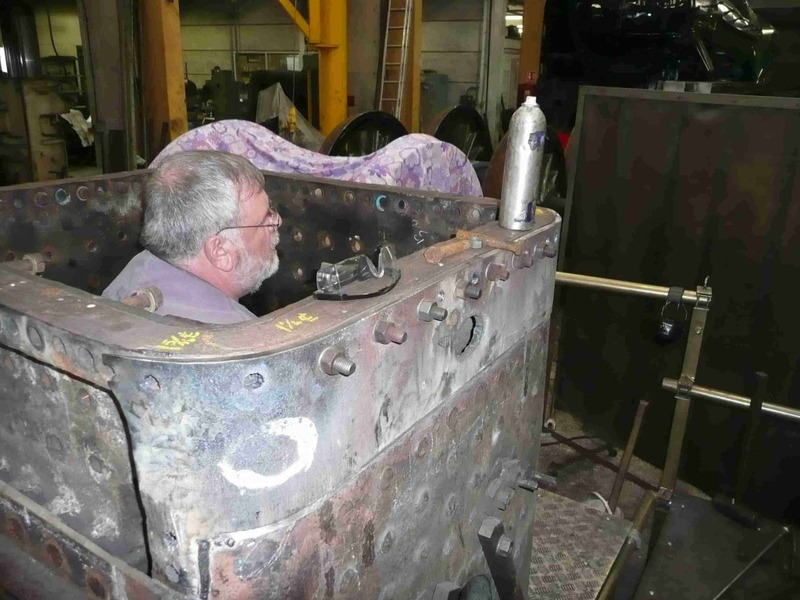 With all the time, effort and skill being applied by the workshop staff, the firebox work is rapidly coming together. With summer coming, we can hopefully move on to fitting the throatplate, retubing, and working on the frames in coming months. More Photos from the 12th of April are in Rob Faulkner's photo album. Sorry there hasn't been an update for a while, but work is still continuing twice a month, slowly moving 178 closer to completion. The 8th of March saw Phil, Harry and new member John Rich working on the patch screws, and cleaning up the rear plate. Since then, the workshop staff have been working on the foundation ring, and have added all the rivet holes in the rear plate. Apart from a little more grinding on the ears, and adding the mudhole doors, this plate is very nearly finished and ready to be mounted. The 22nd saw Phil, Rob and Duncan working under Ben's supervision to finish forming the front plate. At previous meetings, Birch Grove had been parked so close that we couldn't swing the hammer to form one corner. 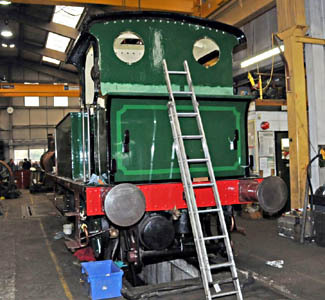 Now that Sir Archibald Sinclair has moved to Horsted Keynes for painting, there has been a reshuffle in the workshop. The space has been taken up by the H class (which is rapidly being stripped), and the S15 wheels, but it has allowed us enough space to finish our forming. A hot day spent with the oxy-propane, and then lots of grinding, has left the front plate ready to have its ears formed. Hopefully, this will now catch up the rear plate and be ready for fitting very soon. No pictures this time, as the boiler looks much the same as before. 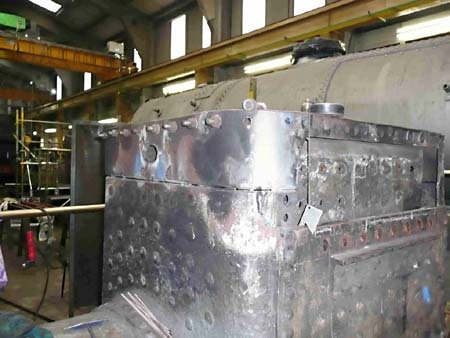 In the next few weeks there should be some visible progress as the platework is fitted ready for the boiler inspector. The 25th was definitely a day of two halves. With four people working, we hoped to get lots of patch screws fitted, but instead it took us all morning to find the countersink. Very frustrating, but that's life in a busy workshop. 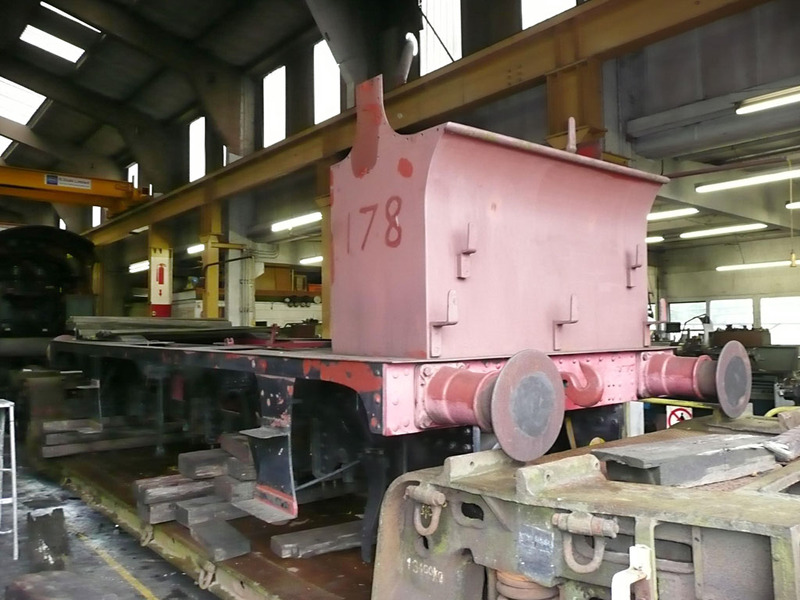 On the plus side, we got to see the rest of 178, which has been moved up into the yard. 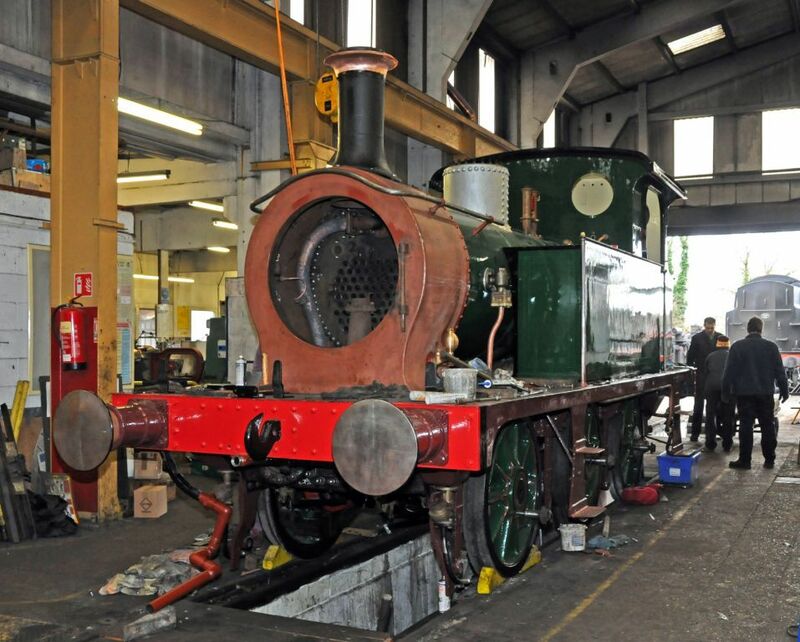 Hopefully it won't be long before we start working on the rest of the engine rather than just the boiler. The afternoon was much more productive though. With Harry working hard at the patch screwing, Phil, David and Duncan started work on forming the 'ears' on the back plate. 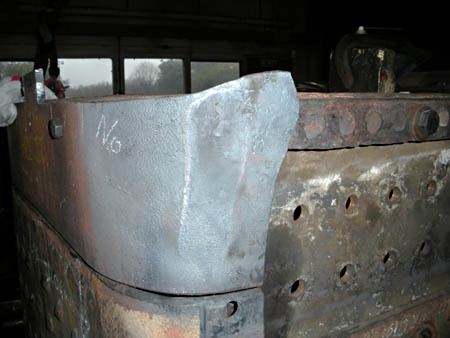 Where the plate on the sides of the firebox overlap the plates on the front and rear, the inner plate needs to taper down to nothing. This is done by heating the plate and drawing the material out between a hammer and anvil. 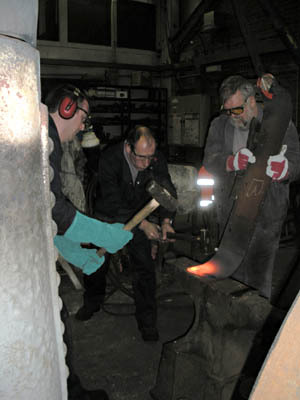 We were joined by Chris Shepherd, and between us, we got both ears formed on the anvil, and then tacked the plate on the firebox and formed around the foundation ring. Everything looks good, and next time we can hammer and grind the ends to a point, and start drilling for the rivets. Our next two meetings will fall on the special weekends with the visiting P-Class 753 from the Kent & East Sussex Railway. 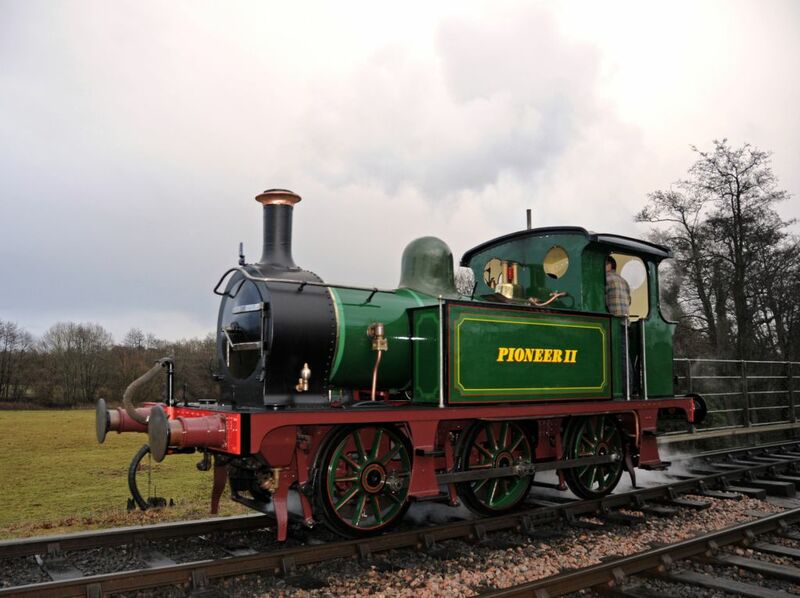 If you enjoy seeing and riding behind this lovely little engine, why not come and see what the insides look like? Every bit of help gets us closer to running our own P-Class this year. Between Christmas and New Year, Duncan and Rob managed to get a day in the workshop, and ground the edge of the back plate to a much better fit. This was then weld-prepped all round. On the 11th January, Ian took the plate and flame-cut most of the remaining extra material away, and Sean spent a while grinding it to a good finish. 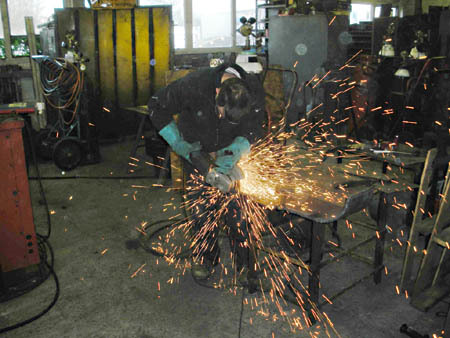 The photo (right) shows him hard at work, making lots of sparks. By the end of the day, the work was done, and the back plate is now ready to have its 'ears' formed on the anvil, and the rivet holes drilled. The rest of the team started getting to grips with the patch-screwing required in the inner firebox. There are 160ish corroded rivets that need to be removed alternately, and then replaced with copper patch-screws. After burning out the rivets, the hole is cleaned through with a 3-fluted drill (not as easy as it sounds), and then roughly countersunk. The hole is then tapped (which seems quite difficult to keep straight), before using a special hand cranked countersinking tool to get a perfect countersink. The patch-screw is then inserted with some sealant on the threads, and wound in until the head shears off. Finally, the head will be hammered down to a tight fit with an air-hammer. Chris tells us that a good pace would be seven a day, so you can get a feeling for how much effort is involved! The photo below shows Rob manhandling the drill, and trying to get a good clean cut through the plate. It's not as easy as it looks! 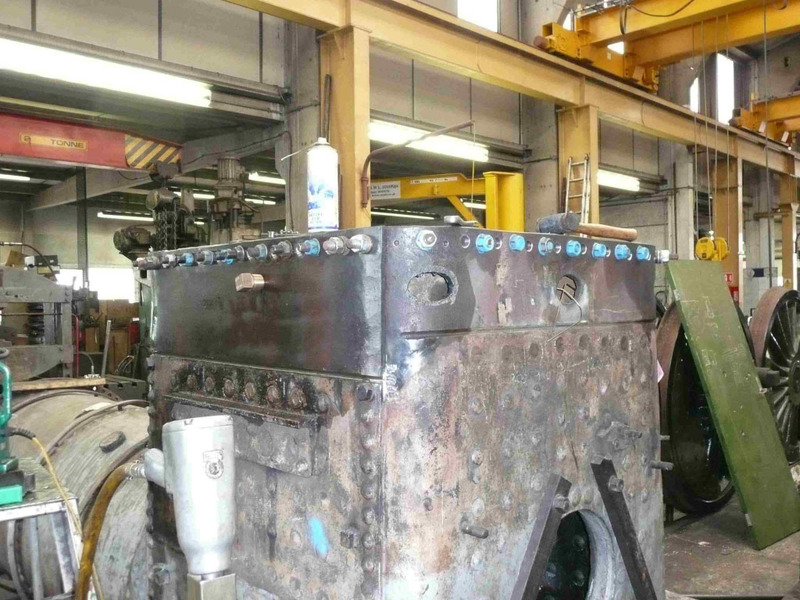 We're going to be having many more weeks of doing this before it's finished, so if you've ever thought of coming and helping restore a Bluebell engine, maybe now is the time! The last meeting in November saw us spending the day heating and hammering, but we were a little too ambitious and managed to overheat the boilerplate. This has the effect of reducing the carbon content of the steel, weakening it and making it unsuitable for boiler work. We learned this lesson the hard way, as the front plate we spent the last 3 months forming had to be scrapped and started again. On the 7th of December we cut a new piece of plate to size and started forming it round. On the 14th we had all the cold forming done, the mounting holes drilled and started to hot form the corners. So although it took about 3 months to form it in the first place, we actually only lost about 2 meetings worth of work. We have managed to continue on the back plate however, and this has had what we hope is the final hot forming. We have now started cutting away the bottom edge to close up the gaps, and should finish this next time. 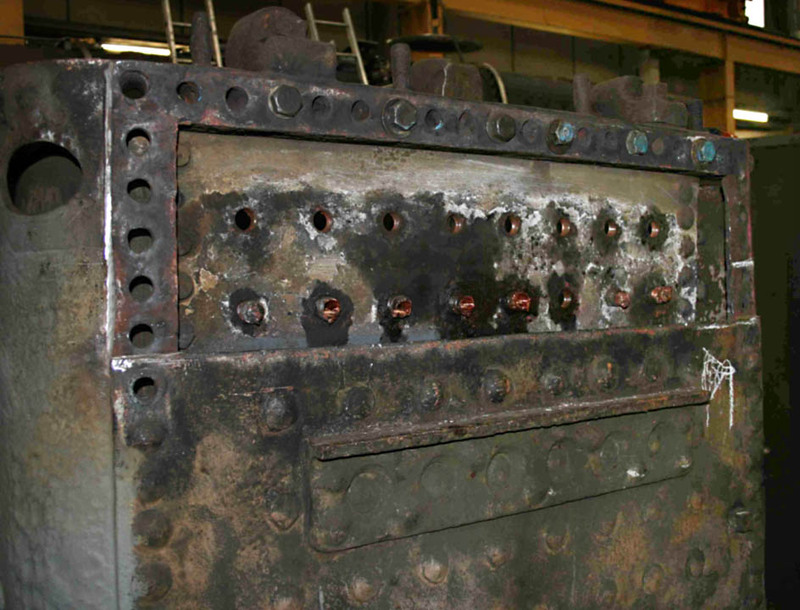 Between meetings, the workshop staff have removed every other rivet from the inner firebox, and in the next few weeks we will have to replace these with patch screws, before removing and replacing the other half. No photos this time, as we all forgot cameras, and everything looks much like it did before we ruined the throatplate. Merry Christmas! Phil and Ian started the day by flame cutting away some of the excess plate, to reduce the amount we need to heat. We were then ready to start heating and hammering the plate to fit. 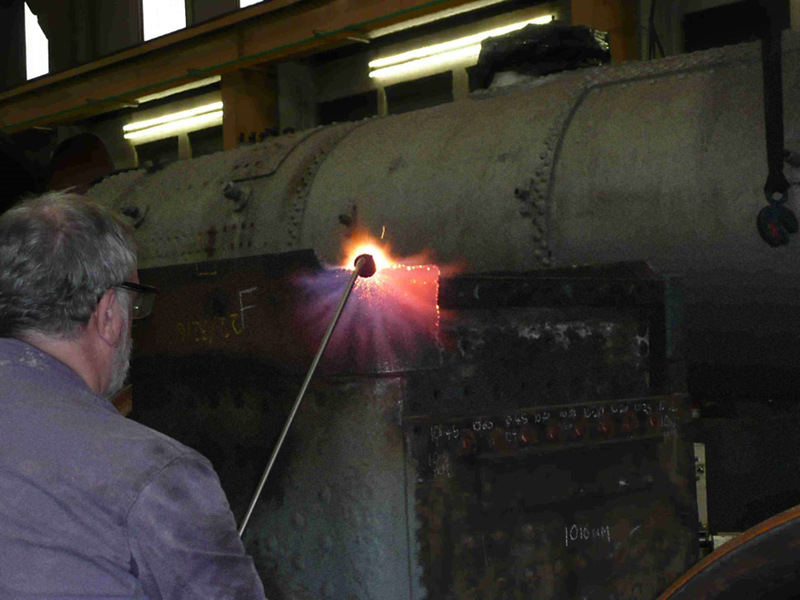 Rob's photo (right) shows Phil heating the corner of the boilerplate with the oxy-propane torch. This thing really uses lots of gas, and we (and the Maunsell society over lunchtime) had to change three oxygen bottles during the day. After getting the plate glowing red hot, there is just a few seconds to hammer it to shape before it cools down too much. Rob's picture (below) shows Duncan holding the set against the face of the boilerplate while Ian hammers against it with a small sledge. The plate is really hot, and all the tools, and everybodys gloves were smoking while working! 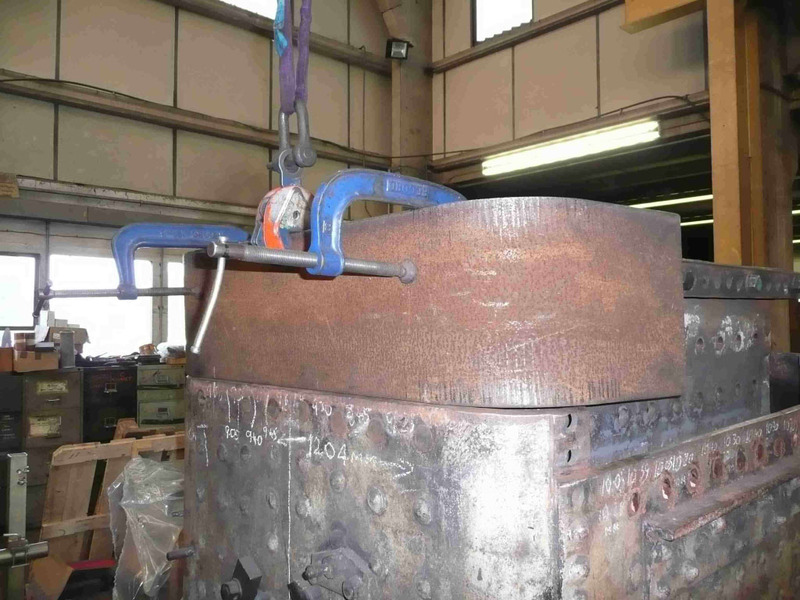 By being careful about which parts to heat and where to hammer, we managed to get the plate to fit to both the foundation ring and the outer firebox. By the end of the day, we had one corner almost perfect, and another almost there. The next meeting should see us sort the other two, then grind away the mating faces to get a good fit. More Photos from the 9th of November are in Rob Faulkner's photo album. The 26th of October was another successful day, after the disappointment of the previous meeting. After the usual hunt for tools, and taking some time to build working platforms, Phil and Ian started preparing the cut edge of the throatplate. Rob's photo (right) shows them hard at work grinding a perfectly straight edge, then adding a chamfer to prepare for the welding. After deburring the inside face, this job was finished except for some little spots which will need building up and grinding back. 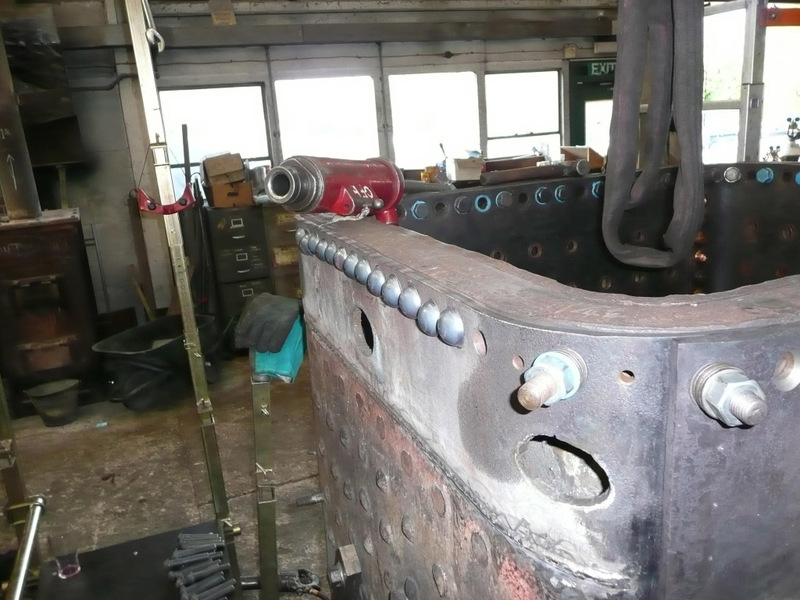 At the same time, Rob and Duncan had some instruction in using the radial drill, and drilled three undersized holes in the previously prepared plate for the back of the firebox. This allowed the plate to be bolted against the foundation ring, so we can start blacksmithing it into shape later. Thoughts then turned to forming the front plate on the 50ton press. Unfortunately, the nearby crane was in use (making steam pipes for Archibald Sinclair) so we had to move it around by hand. This was helped a lot with Phil and Ian's assistance, when they had finished grinding. The first bend on the back plate took two days, the second bend one day, and we now fully formed both bends on the front plate in half a day; we're starting to get the hang of this! There was even time left to drill holes and mount the plate to the boiler. Rob's photo (left) shows the progress by the end of the day. The firebox edges have been prepared, both plates have been rough formed, and temporarily fitted to the firebox. 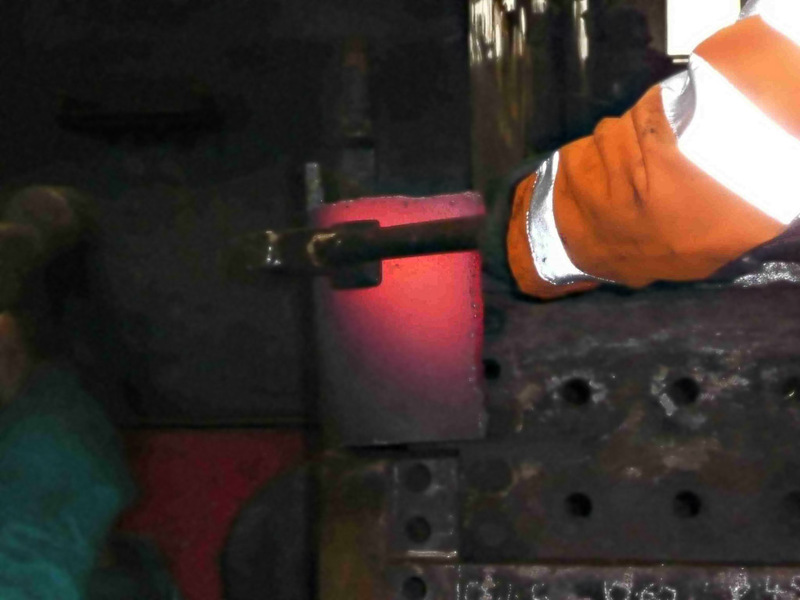 At the next meeting we will be ready to heat and hammer both plates to make them a good fit to the firebox. More Photos from the 26th of October are in Rob Faulkner's photo album. The 28th of September was a great day, with plenty of visible progress. Ian finished burning out the foundation ring rivets, then cut around the throatplate stays, and finally cut away the plate. After removing the remaining eight copper stays, we reached a major milestone, having now removed everything that needs removing, and now have to work on putting good parts back! 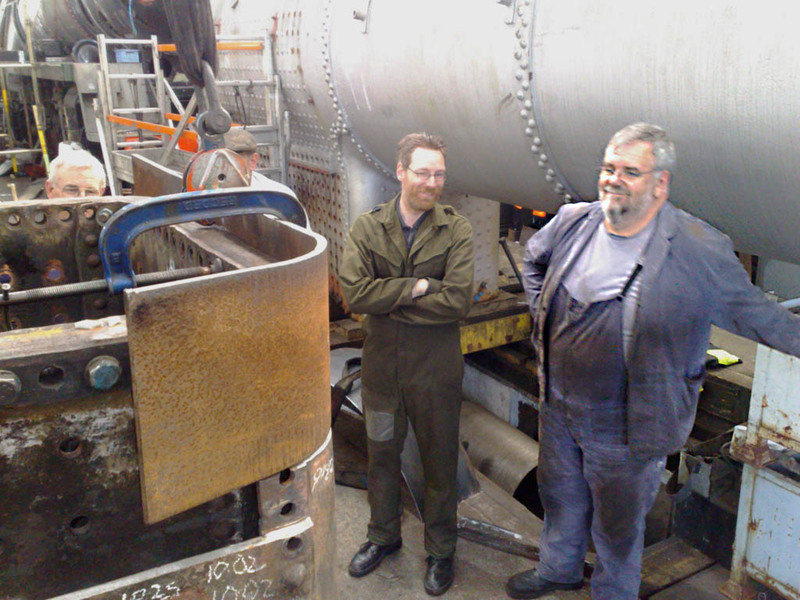 Rob Faulkner's photo (right) shows Phil and Ben inspecting the flame-cut edge. 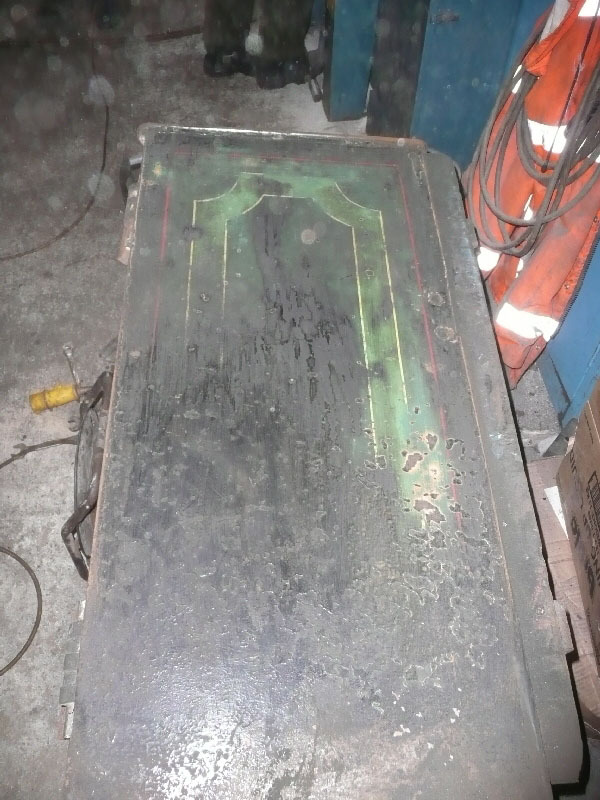 This will need grinding and weld-prepping at a future meeting. 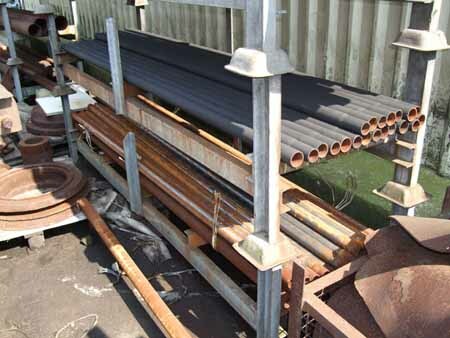 In the background are the superheater tubes waiting to be fitted to Archie's boiler. 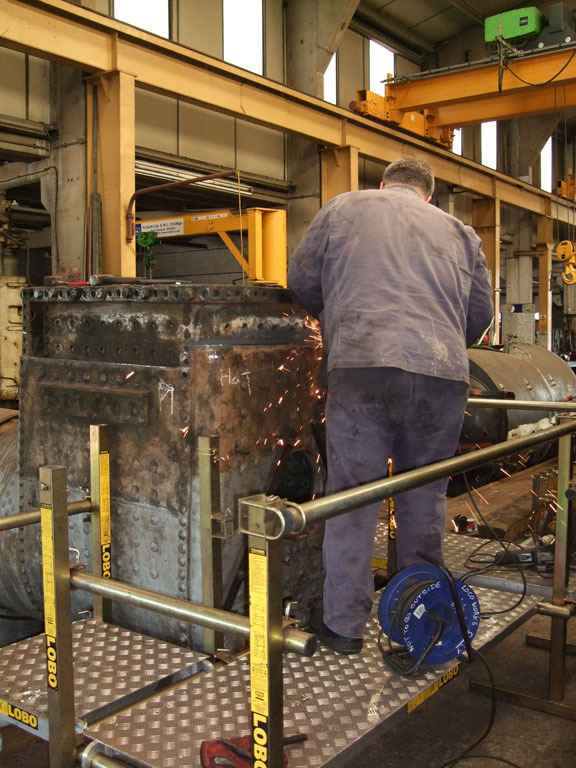 While all this was going on, the rest of the team were working to form the replacement plate for the back of the firebox. Over the previous two meetings we had formed one corner as best we could, and we now did the same for the other corner, only MUCH faster! It's amazing how much faster we can do these jobs now, with a bit of practice. Remember we all started this project with very little experience, and have all learned a huge amount. 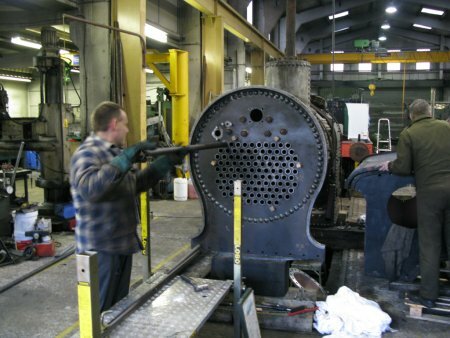 If you fancy helping out with loco restoration, please get in touch, you don't need any prior experience. Rob Faulkner's photo (below) shows the new plate trial-fitted to the back of the firebox. The first corner was a superb fit, but the second was more difficult. The foundation ring protrudes further than the firebox plate, so it is impossible to form the correct curve to fit. We made the best bend we could, and it will need heating and hammering to the correct shape in future. More Photos from the 28th of September are in Rob Faulkner's photo album. After such a successful day on the 28th of September, we arrived on the 12th of October ready to make some more progress. Unfortunately, this was the week before the Autumn Gala, and the failure of 592 meant that it needed space in the workshop. The resulting shunt around left us no space to work on our boiler, so very little was achieved. We managed to put a first-pass bend into the plate for the throatplate repair, and left it at that. Ian spent the 24th August burning out rivets holding the throat plate of the boiler to the foundation ring. He managed to get half of them out, with the remainder dealt with two weeks later. 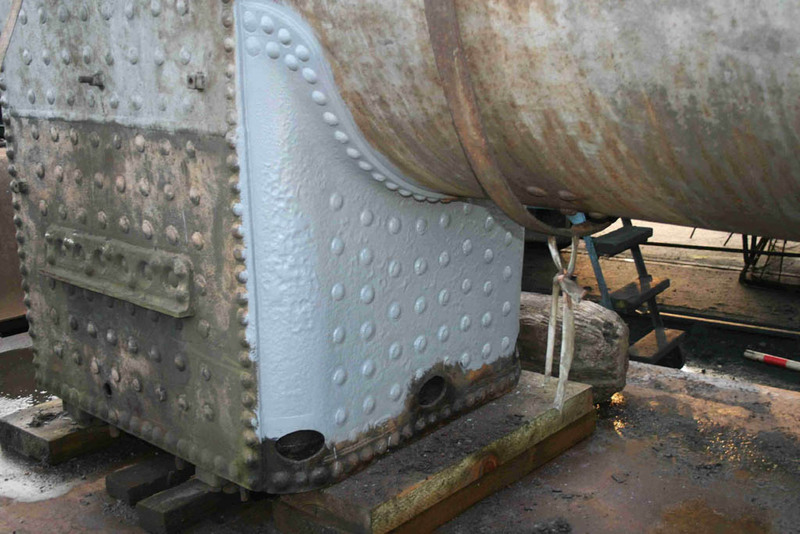 With the rivets out the worn part of the throat plate can now be cut out and replaced. Duncan and Phil were preparing the new plate that is due to replace the worn plate that has already been cut out from below the fire-hole. Their work meant starting with a flat section of plate and bending it to fit round the corners of the firebox. 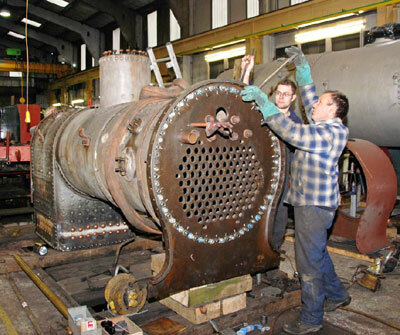 We are now at a stage where we are starting to put the boiler back together. The photos from David Pratt (right) and Rob Faulkner (below) show Ian in red, Duncan in green and Phil in blue having lifted the plate into place to see how it fits having bent one corner into shape, a perfect fit; and Ian burning out the last of the firebox front-plate rivets. More Photos from the 14th September are in Rob Faulkner's photo album. Last weekend saw four members working on 178's boiler. Ian carried on with the weld prep work, and then burning out the remains of the patch screws. Harry attacked the remaining bits with a hammer and chisel. The photo on the right shows various sheet parts for Archibald Sinclair are clustered around our boiler. Lots of work seems to be going on there during the week. 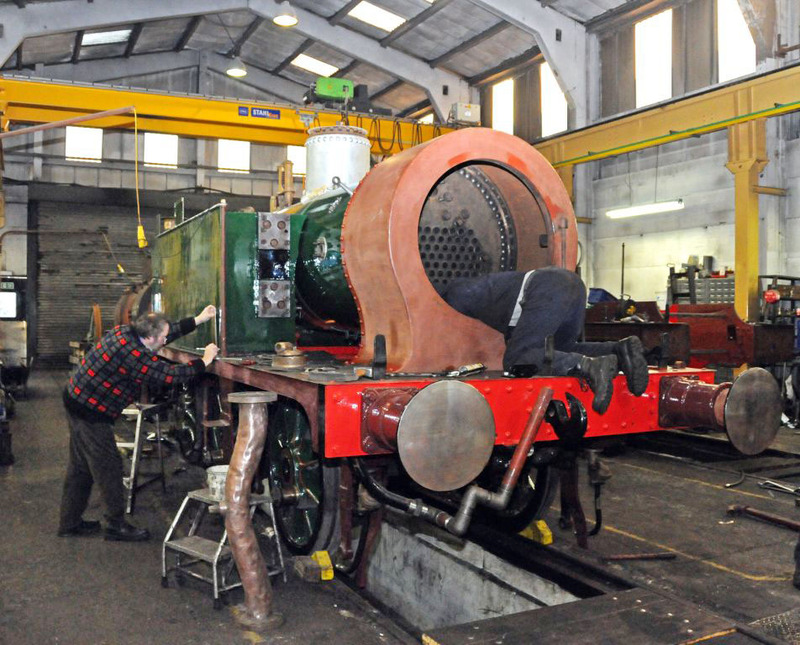 In the background of the picture, Ben Weatherall can be seen preparing the crane to lift Birch Grove off its wheels, and 'Sir Archibald Sinclair' can be seen in the background, ever more complete. Rob and Duncan spent the day annoying everyone in the workshop while chiselling the heads off 32 boiler stays. Hard and noisy work. 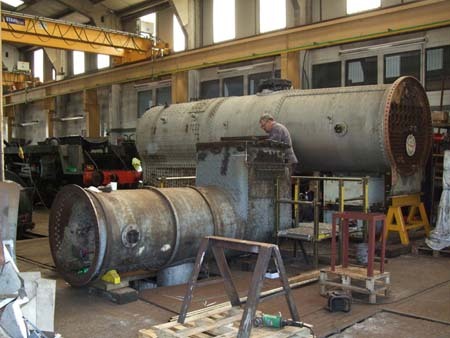 Although it looks like not much has changed for a while, the boiler is now cleaned up and ready to take new boilerplate. The next meeting should see us cutting and forming new pieces, and start fitting them. Report and photos with thanks to Duncan Bourne. Last weekend saw three of us working on 178. 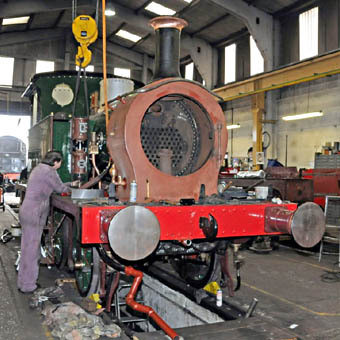 With the successful test of Sir Archibald Sinclair's boiler, the workshop has been moved around. 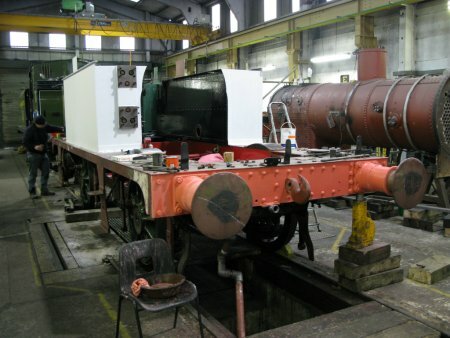 This picture on the right shows the new layout, with our boiler moved to allow space for 847's boiler. 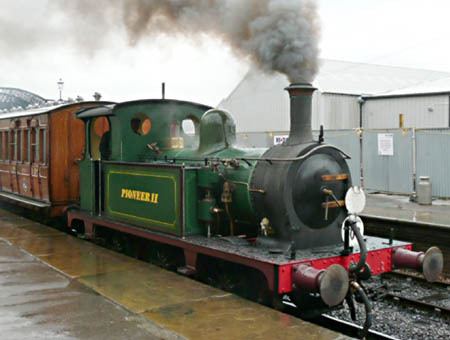 Archie's frames and smokebox can be seen behind. 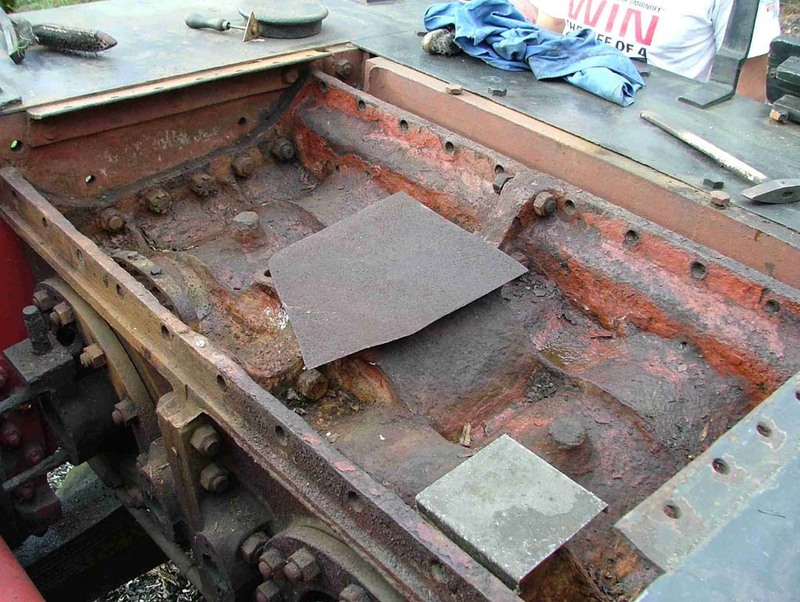 Below, left: The plate has now been cut away on both sides, and the back of the firebox, and the stays removed. Phil spent the day grinding the flame-cut edge flat, and then giving it a weld prep. We should soon be able to fit some new plate to the rear section, and then work can start on the front. 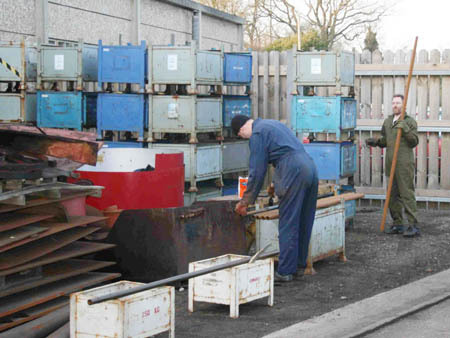 Below, right: Meanwhile, Laurence and Duncan continued with tube cleaning and painting, managing to do 25 in the day. This leaves us just 35 in the pile waiting for cleaning, which should (with luck) be finished on the 13th of July. Speaking with the workshop staff, we think we are still a year away from outshopping 178. Unfortunately, this means that we will miss Branch Line, and also the end of service of 65, meaning we won't have a chance to run all 3 SE&CR liveried locos together. More volunteers would help of course, and you don't have to have any prior skills, or be young and strong. You are welcome to attend whatever hours you can, as any help will be appreciated. Work of the past few weeks has seen the removal of more rivets from the back of the firebox. 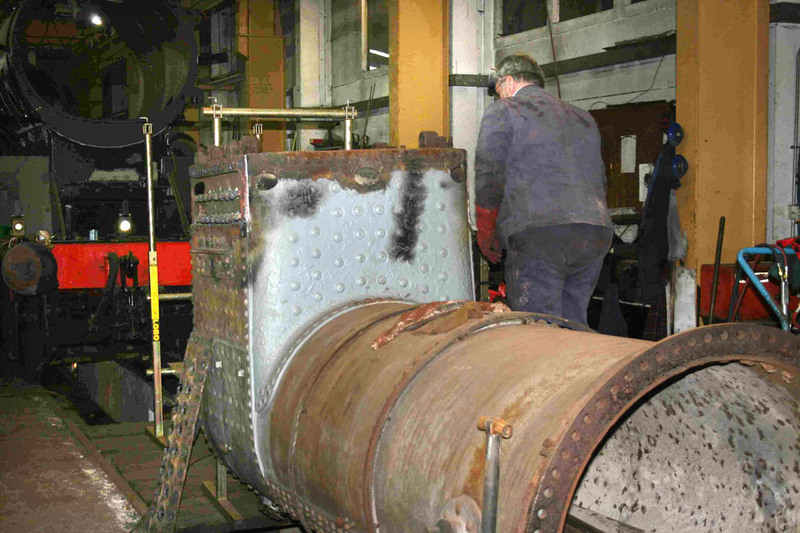 Last weekend saw us removing some of the stays from the section where the outer firebox plate had been removed. 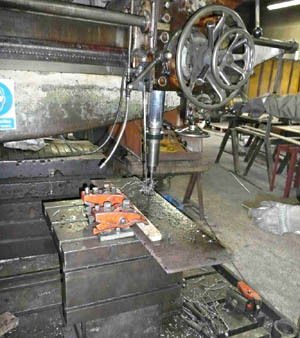 Rob's photo shows the stays which would not come out any other way in the process of being drilled out. More photos from the day are in Rob Faulkner's photo album. Rob Faulkner's photos show the working party once again working on the P-Class boiler destined for 1178. 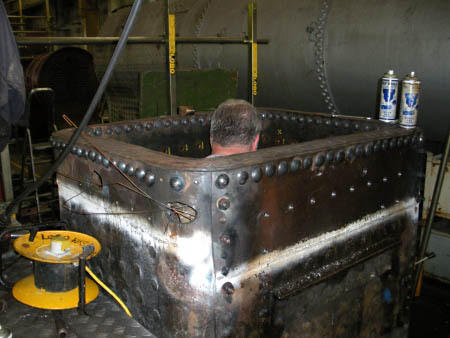 Sunday also saw the team removing the first sections of the outer firebox, the bottom of both sides, after weeks of burning out rivets. Rob Faulkner's photos show that the boiler is now sitting in the works, and the team have begun the job of removing rivets and stays from the firebox, so work can commence of replacing some of the platework. Also a couple of the team have been working on cleaning up the boiler tubes from a few years worth of rust. They have also been adding a protective coat of paint to these, so that their hard work doesn't go to waste. 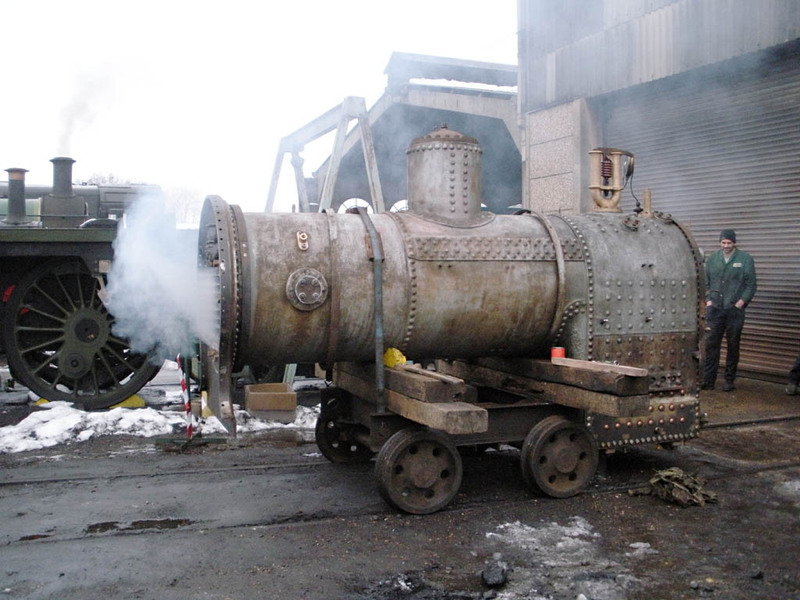 Rob Faulkner's photos illustrate the boiler destined for 1178, which received a washout. This boiler is actually the original boiler from 323 'Bluebell', when it arrived on the railway in 1960. The throatplate was also cleaned up and given a protective coat of paint. Phil is seen in the photo on the right, loosening the stud nuts on the boiler. 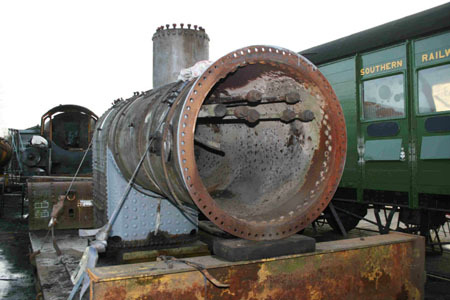 It is hoped that, by the time of our next visit, the boiler should be in the works. 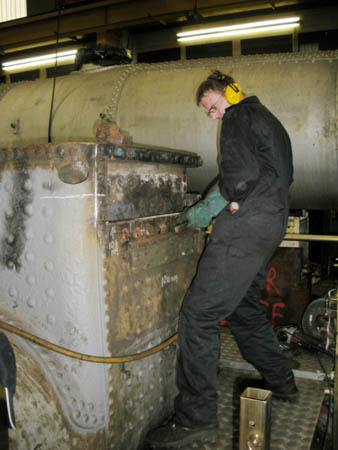 Below:	Ian and new volunteer, Duncan, are seen below cleaning up the boiler tubes and adding a protective coat of paint. Rob Faulkner has provided these two photos showing the start of work on the "third" P-class, the only one of the three not to have steamed in preservation. 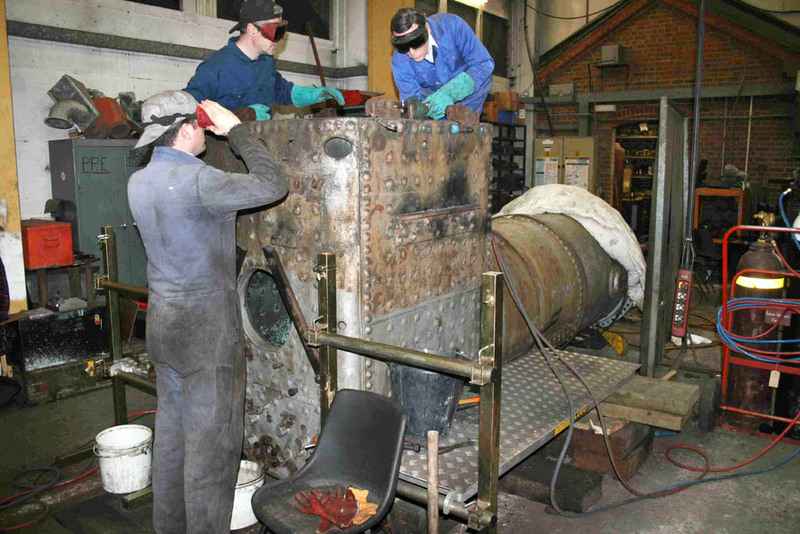 The work undertaken included cleaning the top of the cylinder block, and some work on the side-tanks. Before anyone asks, the livery in which the loco will be restored has yet to be decided, but in accord with usual Bluebell policy, those working on the project have the main say! More of Rob Faulkner's photos taken that day are available here. 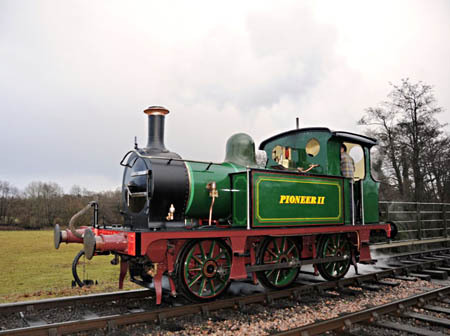 Note: the locomotive is now back in Bluebell ownership after some years in the custody of Southern Locomotives Limited, who had started to overhaul it for use on the Bluebell. Narrative written and edited by Richard Salmon, Rob Faulkner and Duncan Bourne. Photos © Rob Faulkner, David Pratt, Derek Hayward, Tony Sullivan, Andrew Strongitharm and Duncan Bourne. Last updated 5 March 2010 by Duncan Bourne and 13 July 2010 (and 1 August 2011) by Richard Salmon .